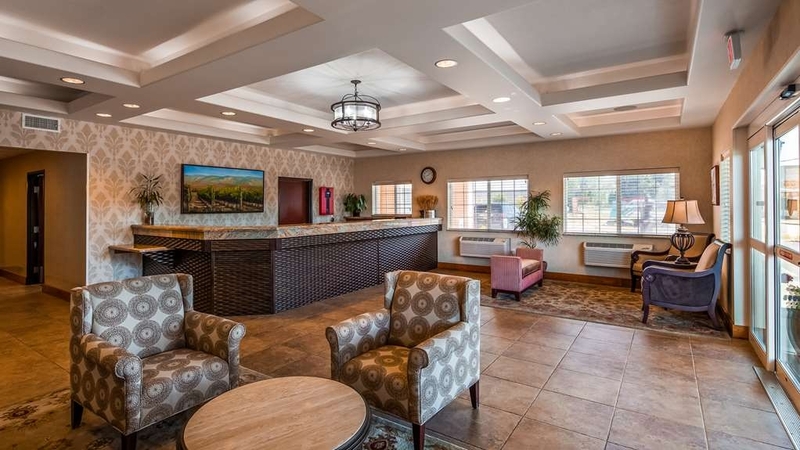 El Best Western Plus Walla Walla Suites Inn se encuentra en el centro de Walla Walla. Venga y disfrute de las mejores atracciónes turísticas cerca de nuestro hotel. Precios bajos garantizados y ofertas exclusivas. Situado junto al colegio universitario Whitman y a poca distancia a pie del centro de la ciudad, este hotel de Walla Walla, Washington, ofrece un servicio de atención al cliente de primera clase y unas confortables habitaciones. Durante su visita a la ciudad disfrute de la exclusiva oferta de Walla Walla, Washington. Visite el museo de Fort Walla Walla para asistir a vibrantes eventos de verano. Desplácese hasta el campo de golf de Wine Valley, elegido como uno de los mejores de la zona oeste o asista a una representación teatral en formato tradicional de las obras de Shakespeare en el Power House Theater o disfrute de un recorrido por el galardonado centro histórico de la ciudad. La mejor parte de todo esto es que el Best Western Plus® Walla Walla Suites Inn está situado a poca distancia de todos estos lugares. ¿Desea asistir a un de los eventos anuales de Walla Walla? Póngase en contacto con nuestro cordial personal para conocer las actividades que se estén desarrollando en la ciudad durante su visita. Algunas de las actividades locales de mayor renombre incluyen el evento de globos aerostáticos Balloon Stampede, la carrera ciclista Tour of Walla Walla, la muestra de autos Wheelin' Walla Walla y eventos de cata de vinos o actos en bodegas. El Cuerpo de Ingenieros, el colegio universitario Whitman, el Hospital Providence of St. Mary y el Hospital de Veteranos están situados asimismo a poca distancia de este hotel Best Western de Walla Walla, algo idóneo para viajes de negocios, eventos académicos o viajes por motivos médicos. Este hotel cuenta también con salas de reuniones para entre 15 y 50 personas idóneas para reuniones de negocios, bodas, recepciones, encuentros y mucho más. Tras un día de negocios o recorridos porla ciudad, relájese en las amplias habitaciones de este hotel BEST WESTERN exclusivamente para no fumadores y que admite mascotas de Walla Walla. Todas nuestras habitaciones cuentan con acceso a Internet de alta velocidad y unas habitaciones con todas las instalaciones y servicios Premium que cabe esperar de la marca BEST WESTERN. Además, durante su estancia en el Best Western Plus® Walla Walla Suites Inn podrá disfrutar de un desayuno completo gratuito todas las mañanas, hacer ejercicio en nuestro gimnasio o disfrutar de un baño en nuestra piscina o nuestro relajante balneario. Convierta su próximo viaje a Walla Walla en una experiencia inolvidable en el Best Western Plus® Walla Walla Suites Inn. Disfrute de su estancia en nuestro hotel. Nuestra piscina y bañera de hidromasaje permanecerán cerradas hasta finales de abril. Rogamos disculpen las molestias. Thank you for continuing to stay with us over the years. We look forward to seeing you again soon. We always try to stay at best western for points. This was clean and well located. I like that they have compostanle cups in the breakfast room. I would love if all best westerns did this for the cups in each room as well. I also would love if they would stop using single use plastic utensils. It creates so much waste. Either real silverware or compostable. Thank you for choosing to stay with us. We are happy that you enjoyed your stay with us. I will certainly look into the compostable utensils. 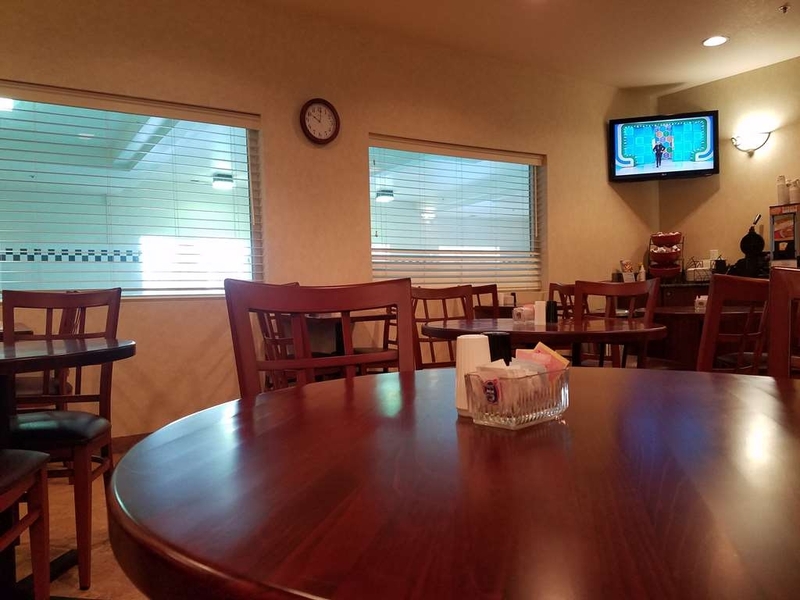 "Very comfortable, good breakfast, easy to access and walking distance to attractions"
This was my first stay at this Best Western and i was very happy with the facilities. My room had a nice sitting area with a comfortable loveseat and table, desk, frig and microwave. The sink was separate from the bathroom area. There was popcorn along with the coffee. No tea, but the popcorn was a nice touch. Bed was comforable as were the pillows. The breakfast had lots of hot and cold options and did a very nice job providing for and isolating from contamination the food for folks with allergies. It is easy to get to this hotel from highway 12 and you can easily walk to the downtown area from here. The pool and hot tub were closed for repairs when I was there so I can't comment on them. We are very pleased you enjoyed your stay with us and hope you will be able to come back soon. Our pool ceiling repairs should be done in a few weeks. "Our Go-To Hotel in Walla Walla"
The rooms are spacious and clean (as in spotless!). The guest service is friendly. The parking is easy. And the location is ideal in that there are several good restaurants within close walking distance. 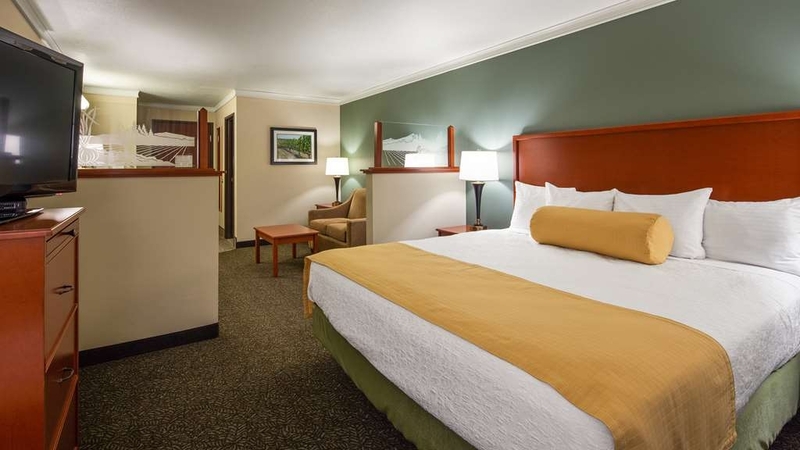 Whenever we travel through Walla Walla, we make a point of staying at Best Western Plus Walla Walla Suites Inn. We are very happy you have enjoyed staying with us and look forward to seeing you in the future. Hotel was very modern, clean, and stylish. Staff was efficient and friendly. Walla Walla downtown is very close, making it an easy walk to food, drinks, etc. Overall a nice stay and I would come back again. Thank you for choosing to stay with us. We are very happy you enjoyed your stay with us and look forward to seeing you in the future. Thank you for staying with us. We apologize that your experience was not what you expected. We hope you will consider staying with us in the future to see how we have improved. "Friendly, clean and comfy. " Visiting grandson in Walla Walla for the weekend. Weather was cold and rainy. We did go to see a movie, but ended up hanging out in our room, playing games and watching TV. The pool was warm and wonderful. Room was great. Beds comfy. Everything clean! Felt like home. Staff was friendly and helpful. Charlie was very sweet. Thank you for choosing to stay with us. We are very happy you enjoyed your stay and look forward to seeing you in the future. Thank you for staying with us. On behalf of the entire staff, I sincerely apologize for the poor performance of my staff during your visit. I am personally disappointed that you did not receive the top notch care that I know my staff is capable of providing. I will be sharing your comments with the whole staff to ensure that this does not happen in the future. I hope you will consider staying with us again so you can experience the outstanding service that we are known for. Very close to downtown area, near wine tastings and restaurants. Very walk-able distance. Great breakfast in the morning with lots of choices. Would stay here again in a heart beat. Good value for the money. Thank you for staying with us and we certainly look forward to seeing you in the future. Easy on/off freeway location. Walk to downtown. Quiet neighborhood. Quick check in/out. Great breakfast. Better room/amenities than expected in this price range. Staff is courteous and professional. Building and rooms are in good repair. We are very happy you enjoyed your stay with us and we look forward to seeing you in the future. "Poor reception, and drab inside"
I apologize for not meeting, much less exceeding, your expectations. I will be sharing your comments with staff as a learning tool for the importance of attitude especially at the front desk. Again, I apologize and hope you will give us an opportunity in the future to show our improvement. "Good location for Balloon Festival"
This was a great value, the staff was very friendly and helpful. They helped make the stay very enjoyable. We have family in Walla Walla, WA and will definitely be stay at this Best Western every time in the future. Thank you for choosing to stay with us. We look forward to seeing you again soon. Thank you for choosing to stay with us as part of your travel schedule. We look forward to seeing you in the future both for work and pleasure. Staff was great was very friendly and check in was fast. The room was clean and the bed was awesome. A very comfortable night sleep. A great place to stay. Breakfast was eggs, bacon, potatoes, waffles and all the other items typically offered at hotels. We are very pleased you enjoyed your stay with us and look forward to seeing you in the future. within 3 block walking distance to downtown. VERY VERY convenient. Large parking area in back for motorhomes/ trailers. Quiet. Well taken care of. Would definitely go back and stay on next visit. Breakfast was convenient and an added value. Thank you so much for staying with us and your wonderful comments. We look forward to seeing you in the future. We spent one night while visiting Walla Walla for some wine tasting. The hotel is just far enough back to be in a quiet location, but well within walking distance of all tasting rooms, wineries and restaurants. The room was comfy with a couch and large tv. The tv came with satellite so there were plenty of viewing options. The bed was decently comfortable, but we found the pillows to be small and tough to arrange to ensure proper sleep position. Our bathroom had a walk in shower which had dispensers for soap, shampoo and conditioner. There were also bars of soap for those who don't like liquid versions. The room was quiet and had the usual fridge and microwave. Breakfast was a large assortment of products, both hot and cold and the room was large to accommodate a number of people. Cookies are served at 7:00pm, but get there early as people line up for them. We plan to visit Walla Walla again and will likely stay here again. We are very happy you enjoyed your stay with us and look forward to seeing you in the future. "Great staff and great location"
Just a short walk into the main street. Quiet. Plenty of parking. Spacious room. Good breakfast. We left an item of clothing behind, and rang the hotel to ask them to forward it to us. This was done, and we were very grateful. Thanks so much. Thank you for staying with us. We are very happy you enjoyed your stay with us and look forward to seeing you in the future. "THERE WAS FECES ON THE WALL!" I was going to write some long review - but my girlfriend and I just want to put the experience behind us. I don't believe anyone cleaning the room (#309) could miss a piece of FECES on a white wall in the bathroom. The room wasn't cleaned - and I have mentally blocked thinking what other crap might have been in the bed.I called the front desk and notified them of the issue immediately and got the hell outta there. Dear Mr. Habibi, We are terribly sorry we failed to meet your expectations on the cleanliness of the guest room. It is our goal not only to meet but exceed guest expectations on service and cleanliness at our hotel. And to provide each and every guest with a fabulous guest experience. To meet that goal we not only train our housekeepers to clean our rooms immaculately, but we also have each and every room thoroughly inspected by our housekeeping supervisors before a guest enters the room. Once again we are sorry we didn't meet your expectations. We will continue to work hard and train staff accordingly. Thank you for bringing this to our attention. And if you would like to discuss in further detail please do not hesitate to call or email us. This is a very nice hotel. I expected something more mediorcre from a BW hotel. We had a king room which was large. When you walk in the door, there is a sink and counter. The bathroom is opposite with a toilet and shower (no bathtub). There were no signs of mildew. The hair dryer was in a bag on the sink, not attached to the wall. Three was a microwave, and a small fridge, and the usual coffee service items. There is a couch with coffee table, and a desk with a swivel chair and lamp. There are lamps on bandstands on both sides of the bed. The lamps have electric sockets on the base, but no usb ports. On a chest with 3 drawers. The room has a flat-screen tv with Direct TV, so there are lots of channels. There is an indoor pool, spa, and exercise room. 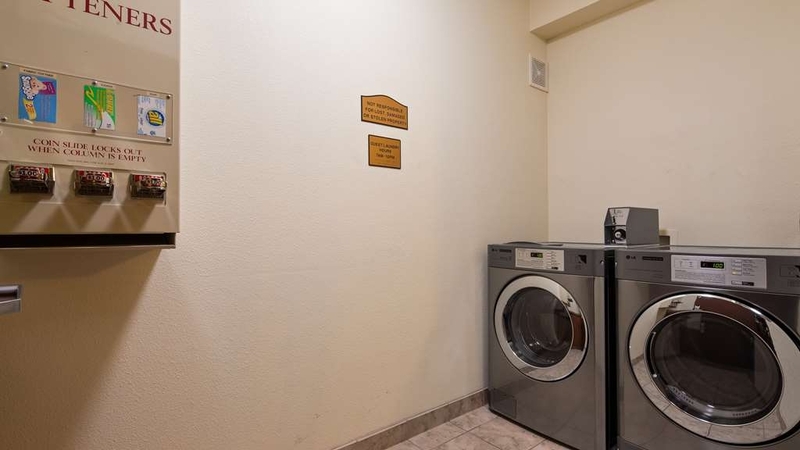 There is also a laundry on first floor. They have a very nice breakfast that includes biscuits and sausage gravy, sweet rolls, make-your own waffles, a fruit salad, yogurt, and the other usual breakfast items. It is a short walk to the downtown area. There are several restaurants within a few blocks of the hotel. There is a Safeway that is only a short block and a half away if you go out the back door of the hotel. Con: the ice and vending are on the 1st and 2nd floor by the elevator. The lobby and elevator are not centered on the building. Since we were on the 3rd floor on the far end, it seemed a long walk three quarters of the way down the hallway to the elevator. There were stairs available at the ends of the hallway near our room. Thank you for staying with us and all the wonderful comments. We look forward to seeing you in the future. "Close to Main St, friendly"
Convenient location near the center of town. Friendly, helpful staff. Room was older but clean and useable. Refrigerator & microwave in room. Linens were not great especially the pillows. Breakfast was standard. Dog friendly. Decent place to stay in Walla Walla, WA. The rooms are fairly large, clean, had a microwave, small fridge, and a coffee maker. Nice tv. Didnt use pool but it sure looked nice. Could hear the movement of people above us but it sounded like kids. I'd stay again, the lication was excellent and the staff were great. The king bed in my room wasnt very comfortable. Thank you for staying with us and for your response. We will check the mattress as it may be time to change that one. We look forward to seeing you in the future should your travels bring you back to Walla Walla. I have stayed here many times and will continue to do so. The rooms are clean and comfortable with good temperature control. The breakfast has many options including protein and they keep it refreshed throughout the breakfast hours. The hotel is within walking distance of downtown Walla Walla and many wine tasting rooms and restaurants. Thank you for your loyalty. We look forward to seeing you in the future. "One night stay, one awesome breakfast"
I needed a room for the night and I chose this one because of the location. Staff was very helpful getting me checked in and I had many amenities at hand but didn't use any uintil breakfast the next morning. What an awesome selection, not just your cereal, muffin, bagel option, but a full meal deal including omelets and all breakfast meats you could think of. We are so pleased you chose to stay with us and we look forward to seeing you in the future. This place is kind of hidden from the main street of Walla Walla, but is such a nice place to stay. This is our second time staying here and it was even better than the first. Jasmine at the front desk was able to upgrade us to a nicer room which made us so happy and her personality was so pleasant and warm felt. She found a place in our hearts. The room was clean and the amenities were the usual, but okay. Would rather have individual bottles of shampoo and conditioner instead of from a dispenser on the wall, and I'm not sure of the step into shower. No tub. Just a shower curtain. Still no glass glasses, which are so much nicer, but we understand. The drain in the sink was slow and we let them know upon checking out. Enjoyed the cookies in the evening. The gal at the front desk when we checked out was equally as nice as Jasmine when we checked into the hotel. Very Pleasant. And, the housekeepers were very friendly, also. What a staff! We would definitely stay here again when in Walla Walla, but spend more than a night to enjoy the pool, etc. Thank you for staying with us and we are very happy you enjoyed your time with us. We look forward to your return visit. Walking distance to all the downtown wineries and restaurants. Very friendly staff that was always saying hello or enjoy your night out. One staff member gave us a map and showed us where all the wineries where and the restaurants, which made it easy. We are so happy you enjoyed your stay with us and look forward to seeing you in the future. "Value and Comfort in one stay"
The BW Plus WW is a great choice, though would warn people it is definitely a family favorite as well (young children will be your neighbors, etc.). Excellent rates and value to match, close to nearly everything in town (walking distance to Main Street shops, for example). Great people with hospitable attitudes! We are pleased you chose to stay with us. We look forward to seeing you in the future. "BEST WESTERN PLUS WALLA WALLA WA"
Tasteful,quiet and clean rooms. Nice indoor pool and hot tub. Staff very accommodating and willing to provide infomation on local restaurants and businesses. Decent mexican restaurant about a block from it. Would definitely stay again. I made reservations back in February and asked for a room away from the noise/machines (corner room) because of my daughter with autism. They did put us on the 3rd floor but in the middle of the hall. I asked where they put us and when they told me, I was like ok, not to cause issue. They had since February to figure it out. The area was quite, but they stuck a very noisy family next to us with a dog. (Don't worry I love dogs). The family slammed doors, talked loudly in the hall and dog barked. I know they cannot predict what can happen with guest, but they could of given us the rooms in the corner or not put a family with a dog next door. I called to ask that they ask the family to please quiet down, and I had attitude from the woman working the front desk. The hotel itself was clean, they had cookies for guest coming in, but the night crew seemed to not be as friendly as most hotels. The breakfast was really good, the woman working the area was amazing. I just wish they had listened to my request for my daughter a little closer. I apologize that we did not meet your expectations for this visit. I have shared your comments with the staff as a training tool to ensure they are giving our guests the best experience I know they are capable of providing. I hope you will consider giving us an opportunity in the future to fully meet your lodging needs. "Our " go to" in walla walla"
This was our last hotel of our 6 day motorcyle trip. This is our" go to" motel when we visit Walla Walla. Last year we heard that the hotel we used to stay in had gone downhill. It's nice to have a good place to stay & not have to think about it. We were quickly greeted and checked in by a friiendly young man.There is a nice pool & hot tub. Our room was nice and clean. The air conditioning worked good. We had a fridge,coffee maker( although there is always good coffee in lobby too). You get all the amenities,includig a hair dryer. Breakfst was a nice spread,enjoyed the little waffles. They have 2 gluten free muffin options. We like to walk across the street to a good mexican restaurant. There is road construction on the street below, but we never heard any noise from it. We are very pleased you enjoyed your stay with us and look forward to seeing you on your next road trip. 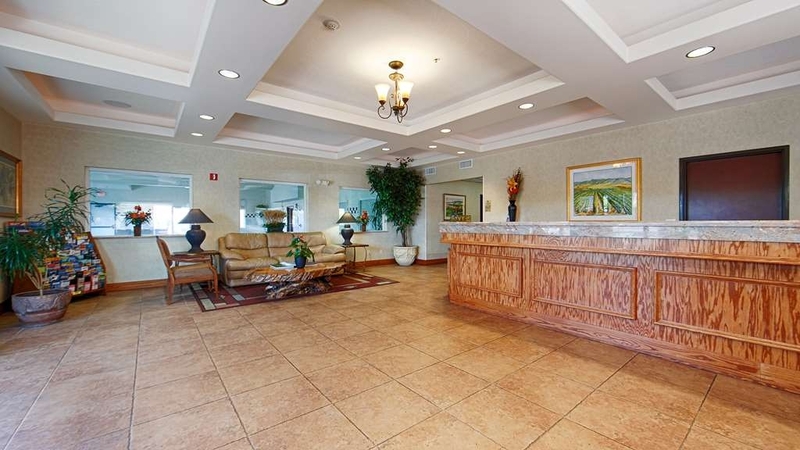 Great, courteous front desk, great location within 3 blocks of downtown. Super clean rooms and a full variety of hot & cold breakfast choices. Nice indoor pool. Free parking. Coffee bar always available in the lobby and warm, fresh cookies every evening. Highly recommend. We have stayed in this hotel several times and appreciate their service. It was nice to go in and be recognized as repeat customers. The breakfast is good and restocked promptly. The beds are comfortable and the room was clean. A shout out to Jasmine at the front desk - thanks for being so friendly and efficient! We are always happy to have guests come back to see us and I always appreciate hearing great comments on my staff. We look forward to seeing you in the future. "Great location, close to downtown"
Thank you so much for staying with us and for the great comments. We look forward to seeing you in the future. I always stay here when I come to Walla Walla. 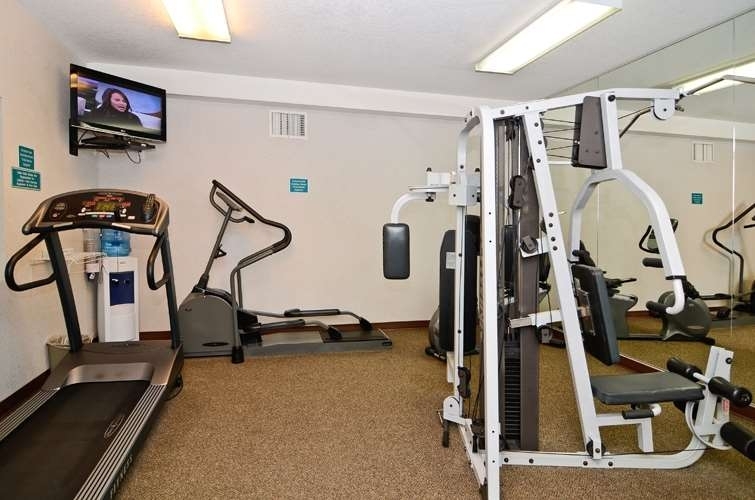 It is clean, convenient to all downtown activities, has a full breakfast included, and a swimming pool. I can walk everywhere in town. Why would I stay anywhere else? A typical Best Western just off the 2nd Ave in downtown Walla Walla. Very clean, service & staff was excellent! Breakfast had a good variety of options. Pool was clean and suitable for a decent swim. Rooms were spotless. I would recommend this hotel to anyone wanting a very comfortable place to stay in Walla.Walla. Close walk to the centre of town. Thank you for choosing to stay with us. We look forward to having you stay with us in the future should your travels bring you back to Walla Walla. My husband and I came for a return stay at Best Western in Walla Walla, as our first experience was pretty good. The room was of a good size, very clean and neat, and there were plenty of places to sit, including a couch and a cushioned seat. Everything worked fine, although the air conditioning was a bit loud. The service was quick and the attendants were cheerful and polite and always quick and ready to help. The complementary breakfast was very good, with lots of variety, and very good coffee. In addition, it was only a few minutes' walk to Main Street in Walla Walla, where there are lots of shops, high-quality wine tasting rooms, and restaurants. For the price, Best Western is a very good place to stay. We stayed in a lower priced motel the first time we went to Walla Walla, and frankly it wasn't worth it. It was very much worth paying a little bit extra for a decent place like Best Western, especially since you get a good complementary breakfast. My husband and I tend to watch our pennies, so after trying other places, we settled on Best Western as a good balance between price and quality. The next time we visit Walla Walla, we're most likely going to stay here again. Thank you for choosing to stay with us and we look forward to having you as our guest in the future. Our construction company reserves the rooms for our crews. Our expectation is they have a clean, comfortable, and secure room after their long 12-14 hour days. Best Western staff has always been an example of excellent customer service which seems to not be the rule in hotel booking lately. We had advance reservations for 33 person cycle group. We arrived early and most of the rooms were ready. The staff made an effort to keep those waiting comfortable. Parking and support for the group was well done. The pool and hot tub were clean and welcoming after a long ride. We are very pleased your group enjoyed their stay with us. We look forward to seeing you all in the future. "A few blocks to town.........however"
With plenty of parking, great location and dog friendly rooms this hotel may work for some. The rooms are clean and large with a microwave, mini-refrigerator, coffee pot. The toiletries were limited to one bottle of lotion, one shower cap, and two bars of soap. The toilet was an "elementary school height", so very close to the floor. There is one elevator, and wheeled racks to carry your luggage. However, the BUT for me is the noise. Do not get a room near the first floor exit doors. Every time someone came in and out the slamming door rattled our door. When management was asked to please put up a sign reminding people to close the door quietly, I was told that it would be better after 10PM during quiet hours. Unfortunately, management failed to realize the banging would begin yet again at 6 AM. A generous breakfast is provided. Try to go earlier as it becomes quite crowded as the morning hours continue. Hats off to Jasmine. An excellent, friendly reception staff!! I apologize for the issues you had with the noisy doors. I am not sure who in management you spoke to but when the staff told me about the issue I had the maintenance staff check the guest doors near there and they did find 2 that needed to be fixed. I am pleased to report they do not rattle now when the door to the outside is closed. We have not resolved the issue with the outside door yet but are in the process and hope to have that issue resolved soon as well. We hope you will give us an opportunity in the future to meet your lodging needs. My room was clean and comfy. Bed was perfect. Customer service has been above and beyond across the board. Breakfast was delicious. Highly recommend this hotel. Two blocks from downtown which is beautiful as well as has fabulous food. We are very happy you enjoyed your stay with us. We look forward to seeing you in the future. Great place to stay within walking distance of downtown and restaurants Staff was great and breakfast was very good with lots of options. Rooms are clean and nicely decorated. Always like to have a mini refrigerator. Front desk staff is friendly and goes out of their way for customers. It is a pleasure to come back each time and catch up with the staff. They helped us with a large group so we could use common area for a surprise birthday celebration. The rooms are ordinary but clean, lots of pillows! We are happy you enjoyed your stay with us. It is always great to hear the staff is doing a graet job. We look forward to seeing you soon. "a much needed remodel is on the way"
We stayed at this hotel last year and I gave it a great review. This time I can say it is still quiet and has comfortable beds. So I can't complain too much. We found the air-conditioning a bit noisy this time and couldn't leave it on auto all night. The rooms do have windows that open so it is possible to get fresh air to cool off the room without air-conditioning. Unfortunately the design of the blackout curtain makes it hang away from the window so there is a great deal of light leakage on the sides. First thing in the morning I was wide awake! Even though this looks like a standard older Best Western and needs a bit of an upgrade the cleanliness and the friendly staff make up for the worn out look of the place. They let us know right away that there was construction going on as a remodel was underway. The thing that impressed me the most was that the front desk clerk greeted me and remembered my preference for a quiet room even though I have only been at that hotel once before! We enjoyed our breakfast and the kitchen staff made a new pot of oatmeal when the other one ran out. She even let me know when it was ready. I really appreciate that the hotel makes the effort to provide milk alternatives and a special case with gluten free items for those that need it. 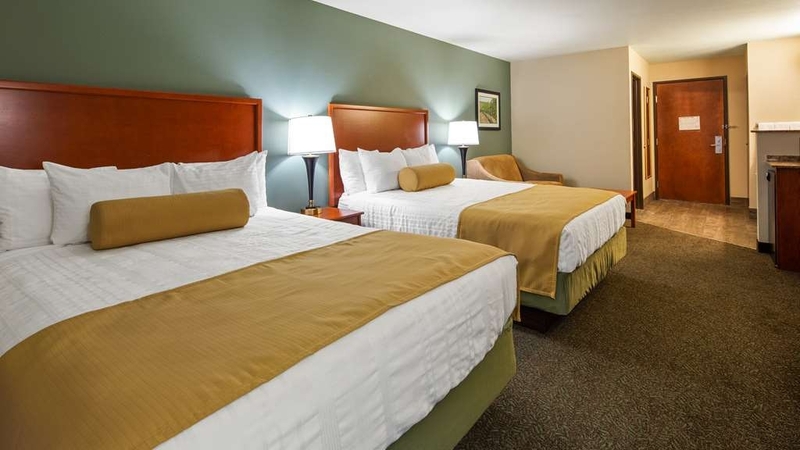 The location makes this a top choice hotel for those visiting Whitman College. Just remember to book early for April and May since there are activities going on in Walla Walla every weekend in spring. Thank you once again choosing to stay with us. We are indeed in the process of renovating and the drapes and part of that change. We look forward to seeing you again in the future and hope you are impressed with our changes, especially the drapes. "Great Stay in Walla Walla!" Recently stayed here for a girls wine touring weekend. The hotel was clean and staff were pleasant and helpful. It seemed like the hotel decor may have had recent upgrades, which was nice. Within walking distance to downtown, very convenient. Breakfast was good, typical egg, meats, fruit, muffins etc. I would recommend if you want a nice, reasonably priced convenient to town hotel. Also very quiet in the hotel. I loved the hot tub, the bed, the room, speedy check-in, customer service and the hard working housekeepers! The staff is kind, personable and very accomodating. The room was very clean and comfortable. Thank you for the amazing rating and the wonderful feedback, we would love for you to stay with us again! Great location for visit to Walla Walla wineries, Main Street and Whitman College. The room was spacious and comfortable enough. Plenty of breakfast and nice pool. Walking distance from everything. One thing I am not sure of is why the price was higher than the inn next door which had more stars. We are very pleased you enjoyed your stay with us. As to our rates, they do fluctuate based on supply and demand as most hotels have been doing for some time and the Airlines/Gas Stations have been doing for a long time. Don't stay here unless you are looking for a de facto daycare! Families running amok day and night , with the doors swinging off the hinges and the with automatic door closers sounding like prison doors slamming shut ! Expect to get little if any sleep or rest . I apologize for the unpleasant night you had with us. We did have a Jr softball tournament in town Friday night and several of the families had rambunctious children. After speaking to the parents we had no further complaints to the front desk after 10pm. I sincerely hope you will reconsider staying with us in the future. We stayed here because we needed an ADA room with roll-in shower and two beds. It was fine for two nights but the room was narrow for getting around in a power scooter. Also, the lights at the sink area outside the bathroom aren't bright enough to see well for putting on makeup, etc. Beds were comfy enough but the sheets were well-worn. Conveniently located with just a short walk to town and tasting rooms. Thank you for staying with us. We will check the lights at the sink to see if perhaps they are not the correct wattage. Thank you for bringing that to my attention. We hope you will choose to stay with us in the future should your travels bring you back to Walla Walla. Friendly staff, great location with easy walk to restaurants and tasting rooms as well as shopping. I have stayed at this hotel whenever I am in Walla Walla and find it a good buy for the location and amenities. Thank you for choosing to stay with us again. We look forward to seeing you in the future. Our recent stay at this Best Western was good. The rooms were clean, the service was good, and the breakfast was great. The breakfast was more self service than other Plus locations, but had many hot options. We are pleased you enjoyed your stay with us and we hope you will come back soon. 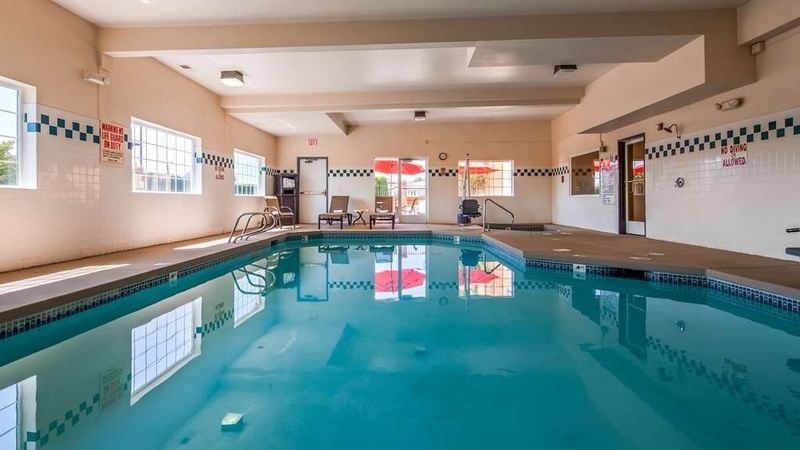 this motel in Wallawalla,washington is one of our favorite places to stay.We go to our grandchildren's swim meets there. They are centrally located for easy access to restaurants and activities around town. Thank you for staying with us and for the great comments. We look forward to your next visit. Easy access to downtown, a good breakfast, a nice pool, and friendly staff made our stay a good one. We enjoyed being able to get away from the Tri Cities but not have to drive too far in order to do so. We will visit again. Thank you for staying and we look forward to seeing you in the future. "Fair stay. 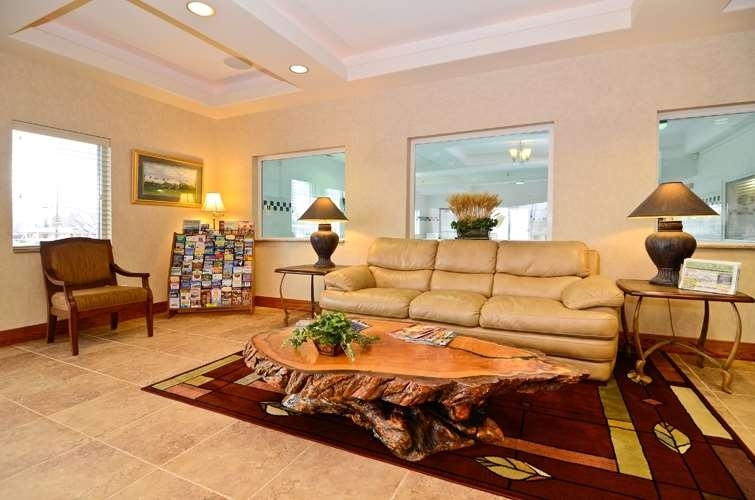 Amenities good and location was great." Overall stay was good. The front desk person was helpful and pleasant. Amenities were good. Breakfast however was not good. Things didn't work and the "fresh" items were not good. If the price includes free breakfast, it needs to be good. Thank you for staying with us. I apologize for the unpleasant experience with our breakfast. Thank you for bringing it to my attentions so I can take appropriate action to improve. We hope you will give us an opportunity in the future to show the improvement. "Great and dog friendly.. even Bully Breeds"
Super wonderful hotel and very dog friendly. Rooms are very clean and nice and they don't discriminate on dog breeds. The staff is super friendly and helpful. Easy check in and out with many tech options. Fast Wifi. "Nothing fancy, but a decent place at a good price"
The hotel location is excellent if you want a quick on/off the highway which is nearby, but not so close you hear the traffic at night; and its close enough to the downtown establishments that once you check in, you can leave your car behind and walk to the restaurants and bars. That's a great feature because then you can easily walk back to the hotel and avoid drinking/driving. There is a nice small pool right in the front of the hotel, which is not my preference because you're kind of on display when you swim. The breakfast bar has a nice variety with some healthy options and includes gluten free items (though I don't know how good they are). The rooms are fine - again nothing fancy, but clean and comfortable with a good bed. Thank you for staying with us and we appreciate all feed back we receive. We hope to see you in the future should your travels bring you back to Walla Walla. We stayed 3 nights. Got the spa room. Nice, BIG, in-room tub for 2. Very spacious room, nice layout with seating area, vanity, mwave, and fridge. We drag alot with us, but it didn't feel cluttered with the space. Staff very nice, cookies, hot breakfast too!! This Best Western felt like we were instantly "home"! Wonderfully clean throughout; staff always friendly and helpful; very quiet yet close to the downtown area! Will definitely stay here again anytime we are in the area!! "ok but we were in a strange room"
The king room we stayed in had a strange layout. The television was blocked by a glass divider and you could only view it from the bed and not the chairs in the seating area. The bathroom had a very low toilet and no tub. The shower appeared to a handicap shower but we were told not. We apologize for not exceeding your expectations. W are looking into either adding a TV to the rooms with the divider wall or taking it out. We have also started changing out our old toilets to ones that are a little higher. We hope you will give us an opportunity in the future to help with your lodging needs. Love this hotel!!! It has a very professional staff at all hours. They are caring and accommodating. Plus, rooms are big, beds comfortable, great breakfasts. Parking is good and is within walking distance of downtown. Near good restaurants as well. I stayed here for my wedding as well as had a block for my guests. They were very helpful when blocking rooms as well as putting my goodie bags for my guests in their rooms for them when they arrived. Two couples went to Walla Walla for a weekend of wine food and some golf in the fog. 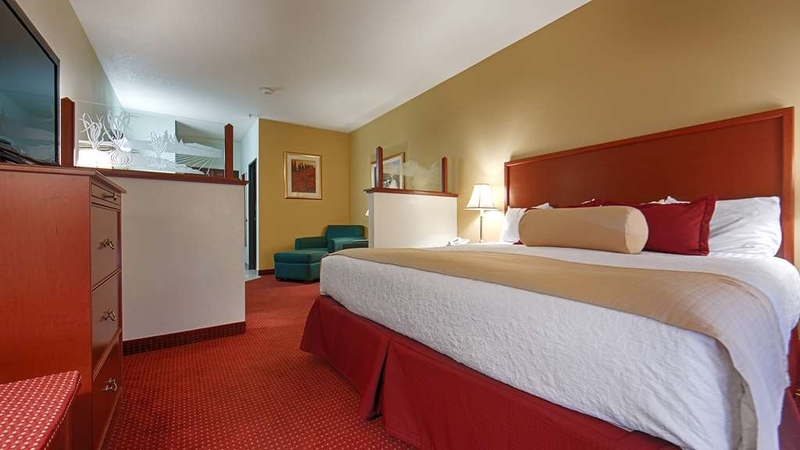 We chose the Best Western because of the value of a hotel in a great location. Walking distance to everything downtown. Good breakfast except we didn't realize they shut it down at 9:00 AM on the weekdays. All in all a very nice place to stay and we will do it again. Thank you for staying with us. We are very pleased you enjoyed your stay with us and look forward to seeing you in the future. "in the heart of wine country"
My hotel of choice in Walla Walla. Easy walk in the Those with RV's will find parking downtown. Many restaurants, wine tasting, shops. Nice rooms with many options. The staff is always very helpful. I like the grassy area with tables out back to sit and enjoy the evening. Those traveling in RV's will find parking available. Right off Highway 12, easy access on and off. We are pleased you enjoy staying with us and look forward to seeing you in the future. Only complaints: not enough outlets in the room but this is the case with most hotel rooms. Hotel is difficult to spot from the main road, it is set back and another posted sign is needed with an arrow to direct guests where to go. Thank you for staying with us. We fully agree with your comment about the need for signage. We have tried several times but have not had success. "Great value in Walla Walla"
Walla Walla has lots of swanky spots to stay, but if you're looking for simple, clean, quiet, and reasonbly priced, this Best Western is the place to be. The breakfast is complete, and although the coffee isn't my favorite, Starbucks is 3 blocks away. Complete satisfaction! We are so pleased you enjoyed your stay with us. We look forward to seeing you in the future. "Consistently comfortable, quiet, and friendly!" Thank you for your continued loyalty. It is always good to hear that we are doing things right. We look forward to seeing you again soon. "If you want no surprises pick this one!" I often stay at Best Westerns because I know what to expect. This one did not disappoint. I have stayed here about 5 times over the years and it has always been exactly as I hoped and expected. It is a short walk to downtown where there are a selection of good restaurants and coffee shops. Thank you for staying with us again. We look forward to seeing you in the future. This is a very nicely run BW. Have stayed there numerous times and have not ever been dissatisfied. The location is within a few blocks of the heart of downtown. We are able to walk very easily to the restaurants, tasting rooms and other businesses from the BW. It is wonderful to know that you have enjoyed staying with us numerous times in the past. We certainly look forward to having you return for another great visit. "Walla Walla Best Western Plus Oct 2017"
When in Walla Walla, this is my place to stay. Hotel is great inside & outside. They have a few rooms with big jetted tubs. Bring your rock-salts or bubble bath & enjoy a relaxing soak. Hotel is located only a few blocks from the downtown area which is perfect for strolling. A few great restaurants are close to the Best Western. Example: Whitehouse-Crawford. This is our second time staying in this hotel. We love this place. It's close to all the great downtown wineries, restaurants and bars. The hotel staff are always friendly and willing to help, the rooms are clean and comfortable and the beds are quite comfortable. I highly recommend this hotel when staying in Walla Walla. We are very happy you stayed with us again and look forward to seeing you in the future. Thank you for staying with us. We are very happy you enjoyed your visit to our hotel and our great little town. Great on the road hotel for business and families. It is near downtown Walla Walla and Whitman College. Lots of good restaurants nearby. It is striking distance from many wineries. It is also centrally located for anyone interested in cycling. We extended our stay twice and the staff went out of there way to accommodate us. And did it with a smile. Clean and great location. We are already planning a trip back at some point. We traveled with our dog and the neighborhood was perfect for walking her. "Allergy alert: Pets may have been in your room"
Our top-floor king room was mostly quiet and comfortable. Short walk into downtown Walla Walla. The railroad spur next to the motel doesn't appear to be used and has pavement over parts. We heard some noise from the hallway, but people were quiet after 10 pm. We also heard occasional barks from the room next door. This is a pet-friendly motel, and dog rooms do not appear to be separated from non-dog rooms. Breakfast room is small with some healthful food choices. Staff was very attentive. The guests all seemed to be avoiding sitting near the loud TV. Thank you for staying with us and for your feedback. We do allow dogs but hope that all guests are aware that if there is any disturbance from a dog we treat it much like disturbance from our human guests. Please let us know and we will make every effort to get it stopped. Convenient, clean, with a friendly staff over Labor Day weekend. This was my first and only visit to Walla Walla, WS. I hope to come back. I would try to stay in this same hotel. I called Saturday evening while at dinner and they found a room for me. I appreciate hotels that have helped me out of a jam. We are very pleased that you enjoyed your stay with us and hope you will be able to come back to see us in the future. "W/E stay at best western plus /Walla Walla"
I had a fabulous stay at your hotel , won 1st place trophy in all Mustangs class with my 67 fastback GT.. Swam in the pool & used the hot tub Saturday night.. Place is clean & very well taken care of , fresh baked cookies on the counter at the front desk..
Great to hear that you won first place award at the Wheelin" Weekend event. We are very pleased you enjoyed your stay with us and look forward to seeing you again next year. Easy location to get too, close to downtown. Nice clean room, decent size pool and excellent continental breakfast. The only issue was the fitness center was small outdated so I could not get a good workout in. Thank you for choosing to stay with us. We hope you will stay with us again in the future as we do have plans to move our fitness room to a larger space in the near future. BW Walla Walla was overall excellent for quality and price. Very neat and clean! Will surely return for a wine tour in the fall. The bed was comfy, and the breakfast was well stocked. I would certainly recommend this model to anyone traveling in the Walla Walla region of Washington State. We are so pleased you enjoyed your stay with us and hope you will come back and see us again soon. "Best Western Plus a Plus in my book!" The rooms were clean and quiet! The hotel had a great location to restaurants, wineries and shopping. Breakfast was super! There was something fir everyone available for breakfast as well as choices on types of coffee. Thank you for staying with us and we are so pleased you enjoyed your stay. We look forward to having you stay again when your travels bring you back to Walla Walla. Needed a place to stay to visit my daughter in the hospital. By the time the clerk was done talking about discounts, the room was reduced in price by $20. Friendly, efficient staff. Nice facility. Breakfast was wonderful, and the cookies in the evening were excellent. We are very pleased you enjoyed your stay with us and hope your daughter is doing well. "Big rooms, very clean, great service, amazing breakfast"
We stayed here 2 nights in August. Very pleased with the hotel. Room was large, very clean, quiet, comfortable. Staff / service was great, when I had a couple of requests I got instant responses even though it was a very busy time. Breakfast was an amazing spread (my teenage son thought it was the best we had ever seen). Lots of hot dishes and large variety of choices. (The breakfast room was a little warm and crowded - but perhaps there was a good reason why!) We didn't swim, but pool and hot tub looked very inviting. The hotel also was in a great, central location. Kirkman House Museum only one block away. Safeway just 2 blocks away, Lots of restaurants also very close by. We would definitely recommend. Thank you so much for staying with us and for your wonderful comments. We look forward to seeing you in the future. Pros: friendly efficient check in and check out; spacious rooms with just the right amount of furniture; breakfast with all the options (waffles, pancakes, eggs/omelette, sausage and bacon and ham, fruit, yogurt, cereal - something for everyone), convenient to downtown and Whitman College. Con: bed was not very comfortable. Thank you for staying with us. Although our beds are fairly new, I apologize that yours was not comfortable. We do hope you will consider staying with us in the future. Good value and nice place. Met all out vacation needs. Close to center of Walla Walla and services we sought. Drive to most nearby wine properties in a few minutes. Walk to many restaurants and shops. Thank you for choosing to stay with us. Should your travels bring you back to Walla Walla we hope you will stay with us again. We love Best Western! Walla Walla was full of people coming to experience the eclipse. BW did NOT raise their rates like some other chains did. The room we had was just fine, as usual. Breakfast choices were good and replenished well. The front desk staff did a great job checking in a crowd of visitors in a reasonable time. When we had an issue with noisy neighbors they were quick to respond. We reported a gasoline smell in the hallway that the desk staff handled very quickly! The beds were comfy, even for me with my fibromyalgia aches and pains! Thank you for staying with us and giving us such wonderful comments. We are so happy you enjoyed your stay with us even with the various disruptions. We hope you will come back and see us again soon. Our stay was comfortable and staff was attentive. Service was excellent, rooms were clean, breakfast had a nice variety of options, and their dog friendly policy was appropriate. Location is very close to downtown and easy access to highway. Thank you so much for the wonderful comments We look forward to seeing you in the future. "Ideal location, clean hotel, helpful staff"
We enjoyed our stay at this hotel, which was reasonably priced, in a great location, offered a good breakfast, and had a courteous, helpful staff. We liked that it was clean and very quiet. We would stay again. Front desk was helpful in recommending wineries and places to eat. We are so pleased you enjoyed your stay with us and we look forward to seeing you in the future. Had a good stay at this hotel, staff was great, very helpful! The hotel is close to town and close to the Walla Walla airport. There are many great shops in town and great places to eat. It is a great place to visit. Very helpful staff and great accommodations. Stopped on way to Bend Oregon. nice detour. Wonderful dinner and breakfast. Wish I hadn't waited so long to review this fine place. Highly recommend this for staff and lodging. Thank you for making the detour to visit our wonderful town. We are very pleased you enjoyed your stay with us and hope you will stop in again. This is a great hotel to stay at in Walla Walla! The staff are friendly and courteous, the rooms are spotless, and there are gluten-free treats in the evening as well as gluten-free breakfast choices. Without hesitation, I would return again. Thank you for choosing to stay with us. We are so pleased you enjoyed your stay with us and that we had the gluten free items available for you. We look forward to seeing you again in the future. "After long drive from Missoula"
"Clean hotel, walking distance to downtown"
We stayed at this hotel for one night on a one week driving trip. Selected because it was close to downtown and we wanted to do some wine tasting but not drive. Hotel as described. Attentive staff. Quiet, clean room, good internet. Small issue with toilet in room was corrected immediately. We plan to stay here on our next trip to Walla Walla! "Great Rooms and Vegan Food Available"
Staff excellent, rooms were very clean and had a welcome feel to them. When I went down for breakfast I was pleasantly surprised that they had vegan food available along with all of the other choices. That was nice for me as I did not have to go out of the hotel to get food. Thank you for staying with us and we are happy you enjoyed your stay with us. We have a wonderful bakery in town that provides us with a variety of options for our guests. This is the second time we've stayed here. No complaints , very comfortable beds, good tv service, good breakfast , friendly staff, walking distance to dinner and main st , will stay here every time time we visit family . We are so pleased you enjoyed your stay with us and look forward to seeing you next time you come to visit. Room was perfect for the price at $116 per night. Staff was courteous and helpful. Great location with gas station and restaurant across the street. Short drive to downtown too where we enjoyed walking through the shops, and enjoying a huge scoop of ice cream at Bright's Candies. And for all the quilters out there, the STASH is a wonderful quilt shop, with beautiful fabrics, and sale items. Staff was very helpful there too. We are so pleased you enjoyed your time in our wonderful town and that your stay was a comfortable one. We look forward to seeing you in the future. This hotel is very clean and comfortable. Th price is reasonable and good location. I stay here each time I come to town, unless it is full, which happens on occasion. I would recommend this hotel to others. Thank you for choosing to stay with us. We appreciate your loyalty and look forward to seeing you soon. We stay here every year for a family reunion and are always blown away by the awesome staff. They are all so friendly and helpful. 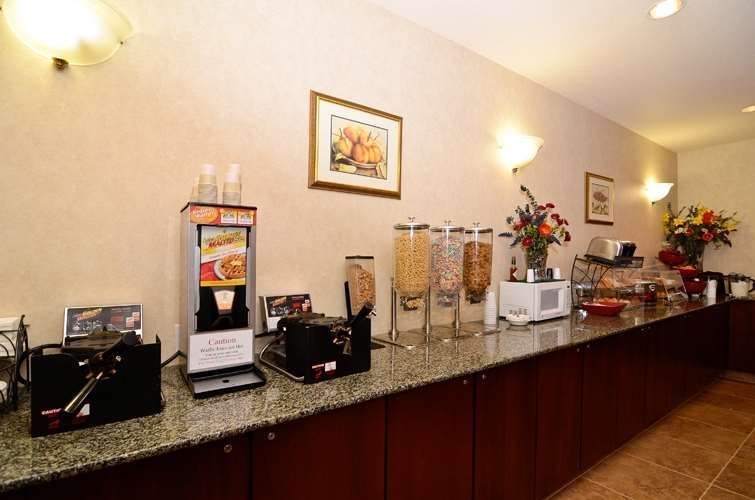 The rooms are clean and the continental breakfast has everything we need and more. Can't complain about the homemade cookies in the evening either. Delightful! Probably a typically good Best Western property with friendly staff. Room clean and breakfast adequate but never great at Best Western. Walking distance into the main town area and restaurants. Happy to stay again. Thank you for staying with us. With our remodel starting this winter perhaps we can WOW you if/when you come back next year. Came to visit granddaughter attending Wittman College. Best Western Pluses are always good and this hotel was very nice. We enjoyed our visit. Walla Walla is a wonderful little city with attractive architecture and lots of shopping. There are many fine places to dine and many places that offer wine tasting. It's a long drive from Seattle, but worth the trip! Thank you for staying with us during your visit to your granddaughter. We are very happy you enjoyed your stay and look forward to seeing you when you come back for another visit. "Excellence in Walla Walla :)"
We are very happy you stayed with us and appreciate the great comments. We look forward to seeing you in the future when your travels bring you back to Walla Walla. "Great location with All the Amenities"
I was late getting to Walla Walla without a reservation and greatly relieved to get a room at this Best Western. From past BW experiences I had a certain level of expectation and this Best Western lived up to the high standard set by corporate Best Western. Very convenient location, clean and spacious King room, very comfortable bed and full breakfast in the morning. I recommend this Hotel to anyone traveling to or throughWalla Walla. Thank you for staying with us and for the wonderful comments. We look forward to seeing you in the future when your travels bring you back to Walla Walla. Excellent location and value for Walla Walla. Has convienient parking, and close to Main St. where great restaurants, tasting rooms, and shops are located. Definitely would stay at this hotel again for future Walla Walla visits! "The Staff Make This Place Special"
Our room had a very comfortable queen bed, sofa, and well designed layout with the sink outside of the bathroom. It felt spacious and open and was absolutely clean. The hotel's walkable downtown location is just off 2nd, so it is quiet. The best part of staying here for us, though, was the very welcoming, warm staff who not only helped make us comfortable in the hotel but also gave us a photocopied map to help us get oriented to the town. Smiles at the front desk made a big difference for us. Thank you for staying with us. It is wonderful to know that you enjoyed your stay with us and that my staff are so welcoming. We look forward to seeing you in the future. 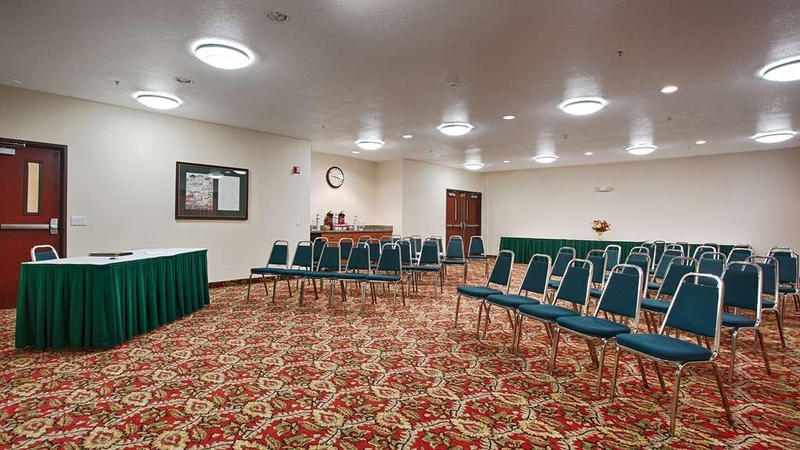 "Great hotel that is centrally located"
Large, clean rooms and friendly staff. The breakfast is excellent. All needs were met. Vegan granola, soy milk, vegan pastries, cut fruit, eggs, bacon, sausage, waffles, pancakes, etc!!! Also liked the complementary microwave popcorn! The wifi is slow but my hot spot worked well. "A nice place to stay the night"
A nice room with a comfortable bed. Not much of a view out the window (just of the roof below), but that wasn't a big deal. 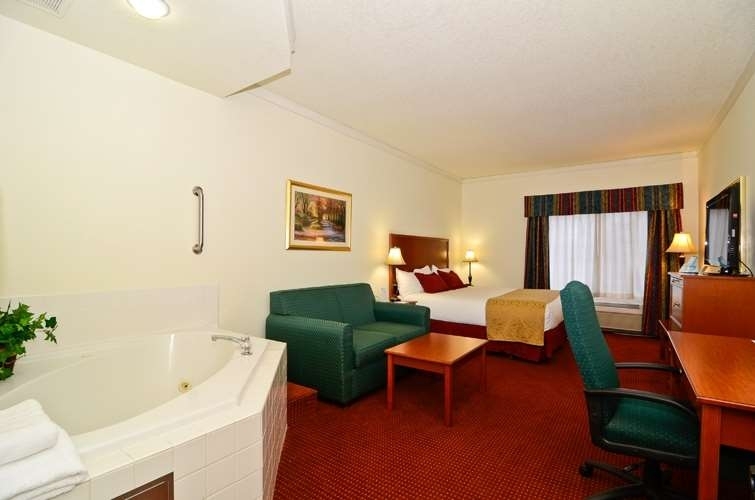 A very nice bathroom, and the hotel is within walking distance of many restaurants and the downtown. The lady helping us check in was probably new, so she needed a bit of help from the other person at the check in desk, but it wasn't an inconvenience. Thank you for staying with us. We are pleased you enjoyed your stay with us. We do have one new person at the desk but she is learning fast. We look forward to seeing you in the future. Highly recommend this hotel. Excellent service and amenities. Friendly helpful staff. Great pool, hot tub, extensive continental breakfast. Very pet friendly. Comfy beds, internet, lots of choices on TV. Thank you for staying with us and for the great comments. We hope to see you again in the future. On our last day of vacation we decided to stay here,just too hot to go on home. We were greeted by a very friendly clerk.She offered us various rooms to pick from.Easy check in and we used the luggage cart to get all our stuff off the bike. The room is very nice,super clean lots of space,microwave,POPCORN!& fridge, and a couch which feels homey. I PLAYED in the pool and hot tub ,both are nice ,also an outdoor patio that is fenced to keep others out.There is also a workout room.There is small coffee maker in the room,good coffee up front & starbucks coffees in the vending machine.We used to stay elsewhere in walla Walla but it's gone downhill .We're very glad we came here and will continue to stay here when visiting family.The rates were very good. I travel with a 60-pound quiet, well-behaved dog, and I highly appreciate a hotel that not only allows a dog of her size, but allowed me to leave a phone number at the front desk for whenever I needed to briefly leave my dog alone in the room while I ran errands or went to grab a meal. The room was sizable, the bed was comfortable, the breakfast was always good (the automatic pancake machine is perhaps my new favorite invention), and the shower was good. This hotel is conveniently located just a few blocks from Main St, and I found that most places I wanted to go downtown were within a relatively easy walking distance. I would stay at this hotel again. We are thrilled to have you stay with us again and look forward to seeing you in the future. "Great hotel with an excellent location." We we're pleasantly surprised with the roominess of our two queen room. Beds we're comfortable (typically I am not pleased with hotel beds). The proximity to the center of town was very nice. We will stay here the next time we are in town. Thank you for staying with us and we are very pleased you enjoyed your stay with us. We look forward to seeing you again in the future. "Great location in Walla Walla"
This BW Plus hotel is situated in the best location in Walla Walla Washingston, close to the main street with lots to see and discover, resturants, shops and plently of wine tasting bars and resturants and good food. There are plenty of wineyards to visit and maybe enjoy their wine tasting. This is a modern, clean property with sizable rooms. Our group was provided excellent service by the staff who also went out of their way to find a room at another hotel for one of our members who had neglected to make a reservation. Breakfast was plentiful, varied, and tasty. We are very pleased your group chose to stay with us and enjoyed your time with us. We hope you will come back in the future. Enjoyed the pool and the sunny weather! Came up to celebrate Father's Day and was blown away by the service from the front desk and the other staff members. Thanks again for the great stay. We will be back! We are very happy you enjoyed your stay with us and look forward to seeing you again soon. "Nice place and close to town"
This is a nice Best Western that is within walking distance to everything. We would stay here again when visiting Walla Walla. Not sure what the criteria is for a "Plus" . Nice staff and the breakfast was a bit better than your typical hotel free breakfast. I wish there was some information on the town's activities provided at check in. The staff didn't seem to know what was happening in town, wine tours, etc. Thank you for choosing to stay with us. I apologize that the person who checked you in was not as knowledgeable as she should have been. It seems we have more training to do with her. We hope you will come visit us again soon to see what she has learned. We are very pleased you enjoyed your stay with us and we look forward to seeing you again in the future. This motel is convenient, comfortable, clean, and reasonably priced. I would recommend it for families, too. It is not fancy, but it is right off the highway and within walking distance of good restaurants. Thank you for staying with us and for the great comments. We are happy you enjoyed your stay with us. I have stayed in this Inn on most of my business trips to Walla Walla. The staff is great, rooms and clean and comfortable and I appreciate the large desk to get my work done. The location is a easy jaunt to the downtown dining scene. We are so happy you have enjoyed staying with us. We look forward to seeing you again soon. The front desk employees were friendly and helpful. The room was very clean, nicely decorated. The internet access was good but not great. The bed was VERY comfortable. I have stayed at this property numerous time and I will stay here again. We truly enjoyed our stay. Thank you! The only concern we had (if I have to list one, since I have pro write 200 words minimum), is that the sinks are outside the bathroom. It would be fine if the two guests were couple or family, but it was a little awkward for us. But we figured out. I started staying Best Western because of my good experience with you in Walla Walla. 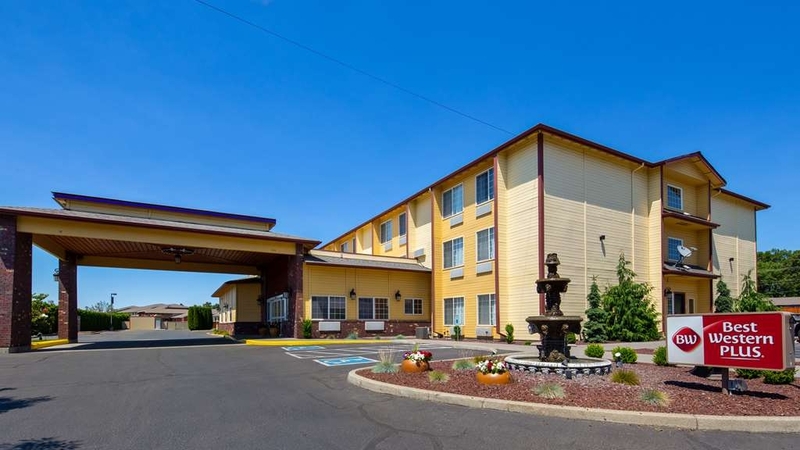 "best western in walla walla, washington"
Great Location. You can walk to downtown in minutes. Great bed, comfortable mattress. Pleasant, professional and helpful staff. I will stay here again. Good breakfast. I would recommend this hotel. Oh, it was quiet, in spite of being fully occupied. We stayed here and wine tasted downtown and it was very convenient. The staff was friendly and helpful. The beds were comfortable and we were able to have our small well behaved dog stay with us. The breakfast was great too! Thank you for staying with us. We are pleased you enjoyed your stay with us and hope to see you and your well behaved dog again in the future. We were visiting family in Walla Walla. This hotel is very central to everything, was extremely comfortable, great beds, internet, food, shower, etc. We will definitely choose this hotel every time we visit there. "Visit to Walla Walla, WA"
Very nice staff, very clean and the beds very cozy. Nice breakfast every morning and staff always willing to accommodate.They have redone a lot of the BW's, much, much cleaner, nicer decor and staff is great. Very nice, clean, with comfortable furnishings. Quiet. Staff was very helpful with information about the area. Rooms are large and bathroom has double sinks. Hotel is conveniently located to center of Walla Walla. Moderately priced. "Great stay in Walla Walla"
Two friends visited Walla Walla for wine tasting and golf. Location was great for both. Short walk to restaurants and shopping. The two queen bed room with double sinks was great. Service was great. Best place I have stayed in Walla Walla and would definitely stay again! Thank you for staying with us. It is wonderful to hear that you enjoyed your stay with us. We look forward to seeing you in the future. 4 blocks to the center of Main Street and many tasting rooms, restaurants, etc. - very convenient. The room was clean and quiet. The free breakfast each morning was average, but a nice option for some quick food/coffee/juice. The Best place to stay in Walla Walla! We've been staying there twice a year for the past 20 years and it's always 5 stars! Perfectly clean and comfortable. Staff is super friendly and helpful. Complimentary breakfast is great. It is great to hear that you have enjoyed staying with us for such a long time. I am also pleased to know that we have been able to maintain our level of commitment to great customer service. We look forward to seeing you again soon. Thank you for choosing to stay with us and for the wonderful comments. We look forward to seeing you in the future. "Good for family with teens"
We stayed in room 104 while touring Whitman College. The spacious room has 3 queen beds but was located near the ice machine at at 0630 folks started using it. The room was adequately clean but overall the place is a little dated for the price. We all liked the breakfast buffet which had plenty of choices along with fresh gluten free options. The breakfast place was super clean and well stocked. Thank you for staying with us during your visit to Whitman College. I am very happy to let you know that we are beginning the process of remodeling our entire hotel. We hope you will be back to see our progress. We have stayed at BW 3-4 times when we visit Walla Walla for Spring Release weekend and we really appreciate how attentive the staff are. The location is great and the value is good. We also appreciate that they are pet friendly. We appreciate your continued patronage and look forward to seeing you in the future. A very welcoming staff. Everyone stopped to chat and offer great suggestions on dining and entertainment. The hotel has charm but is showing signs of needing a face lift. The breakfast was pretty standard fare but everything seemed fresh. It's close to downtown and easy walking ..
We needed a basic hotel room that was clean, affordable and walking distance to the downtown restaurants and tasting rooms. The Best Western was PERFECT. The room isn't luxurious, but it had everything that we needed. The breakfast was pretty good and had a lot of variety. Would definitely stay there again on our next trip to Walla Walla. "Extremely rude front desk assistance." Arrived at the Best Western Plus Walla Walla around 12noon. While I knew the room would not be ready I asked that the front desk call my cell when it was. After 6 hours of playing in downtown Walla Walla (which is lovely) I went back to the hotel since surly my room was ready now. Yep, last room. Sadly the room smelled like wet dogs. With no other rooms to move to & no other rooms available in the area I was stuck. The lady working the desk basically said too bad but here I will give you some room spray to adjust the smell. Gee thanks! Later went to dinner and then out to see a live band. When I returned my keys to the room did not work. Went down to the front desk for new keys. Back up to the room, keys still don't work. Front desk asked me if I was at the right room and if I was putting the key into the lock correctly. REALLY?? Front desk rekeyed again but this time came up to my room with me. As I hit floor 2 in the elevator the ladies says "Oh" and hit the lobby button again. No explanation, nothing. I follow her to the front desk. She rekeys again and hands me the keys. I ask what the issue was. She says I keyed you for room 313 not 213. WOW - no apology, nothing! This even after she asked me for my room number and said she verified it on my reservation. I will NEVER recommend this place or stay here again. I have been in the travel industry since 1985 - I have been fortunate to stay as some really nice places and honestly some average places. I expected the Best Western Plus Walla Walla to at least be a average experience not a poor experience. I am so sorry you had an unhappy experience at our hotel. Although we were full and unable to move you to another room I will talk with the staff about better ways to handle issues. I sincerely hope you will give us an opportunity in the future to redeem our reputation. "Walla Walla Best Western Plus"
The front desk woman was pleasant and helpful. Amazing decor including beautiful watercolors of the area by the owner. Clean and spacious room and great breakfast selections. Close to downtown and Whitman College. We are very pleased you enjoyed your stay with us. The owner will be thrilled to know that you enjoyed her paintings. We look forward to seeing you in the future. "Exactly what we needed. " We stayed here after one night for an event at a nearby winery. The staff was very polite and let us check in a little early without any issue. The room was spacious and very comfortable. I loved the bed and the shower - though the shower head was really high. I could barely reach it; fortunately the setting was perfect and I didn't need to change it. The location was good for us too, a couple of blocks from where our event pick up was. Breakfast the next morning was very good with lots of variety. Real oatmeal in a tureen with a little condiments bar was a highlight. Omelets were good and the baked goods were amazing. They even had a separate gluten-free section all the way across the room so it didn't get mixed up. I would definitely stay here again. 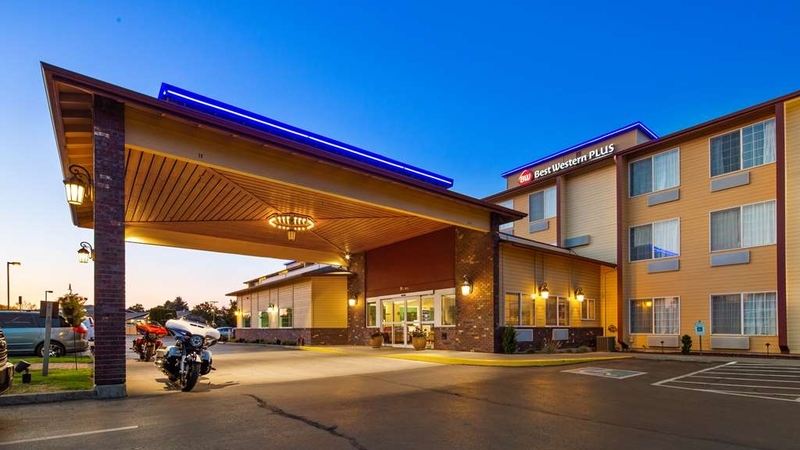 "Best Western Plus Walla Walla Washington"
Best Western Plus Walla Walla Washington is a great place to stay. It is walking distance to downtown shops and restaurants. The location is quiet, comfy beds and pillows, the rooms spotless, the breakfast offers a wide range of foods including soy milk, plain yogurt, fresh fruits, juices, eggs, sausage and bacon, waffles, etc. Staff are very attentive and helpful. There is a small gym and a small indoor pool and hot tub. "Soft comfortable bed that accommodated my curvy figure!" We have stayed at several hotels in Walla Walla and the bed here was the best for me—definitely not hard as a board! I booked months in advance (necessary in April) and made a point of asking for a quiet room away from the elevator on an upper floor. Even though we got there in the afternoon we weren't given a chance to change rooms after they told us they put us in room 309 near the elevator! The place was full of softball girls but they must have all gone to bed early as we never heard anyone running down the halls or even the elevator going up and down. It met most of my other criteria too: the air-conditioner was fairly quiet on auto all night, the shower was hot but not enough to scald a child, the room was clean (no dust bunnies or stains), the sinks (two!) were outside of the toilet/bathroom, there was a microwave and a quiet mini-fridge, the blackout curtains did their job, and my most essential requirement—a nightstand big enough for my CPAP machine with an outlet right on the lamp! In our king room there was even a little sofa and table to sit at and relax in front of the TV. As far as hotel breakfasts go this place was way up there on quality. The kitchen staff was busy refilling the food trays and my husband said his hot breakfast was great—best hotel eggs he has ever had. For me there was hot oatmeal in a big pot (not the instant packets) as well as soy milk for my protein shake. The desk staff was polite and helpful despite the fact that they had a full house and they even apologize when we left for not giving us the room we wanted. There were a few things I wasn't so happy about but wouldn't be an issue for others: the tub side was so deep I had trouble climbing in, the shower head was so high I couldn't reach to change the spray setting, the pool is very small and doesn't allow for modesty since you can see in from the breakfast room and foyer (but safer for watching children), the foyer is also small with only a few couches and the seating area in breakfast room is closed at night. I'd definitely stay here again when we go to the Renaissance Faire at Whitman! If you are up for a walk you can even get to Whitman or a grocery store by foot. Wonderful 2-night stay at the Best Western. Easy check-in, nice facilities, clean room and a very reasonable rate. I was really wowed by the breakfast--such a large variety of food, hot egg and meat dishes, even soy milk and gluten-free options. Nice pool for the kids. We really enjoyed our stay. "Great bicycling vacation in Walla Walla"
Staff were so accommodating of our group of 14 and our bicycles. We came to ride the bike routes of Walla Walla. The hotel had the best hotel breakfast I've ever had. The location of the hotel was perfect once off the bike to walk to town. Thank you for choosing Best Western Plus for your bicycle group. It was our pleasure to have you with us and we are very happy you enjoyed your time with us and Walla Walla. We always stay at the BW in Walla Walla. Their location is so convenient, their breakfast is good and the service is always pleasant. We often travel with our dog and they always try to accommodate us with a room near the door, which is convenient. I would recommend this hotel to anyone looking for a hotel within walking distance to downtown. In a very busy tourist city, Best Western Plus is professional and personal! We love the extra touches, like the warm cookies and candy, as well, of course, as the quiet room and comfortable bed! The price for the quality is great, too! Thank you for staying with us during your visits to Walla Walla and for the wonderful comments. We look forward to seeing you in the future. Stayed here for one night while in town for business. The hotel was nice and the staff was extremely friendly and attentive. The hotel could use some updating but it was clean, The bed was to soft for my liking as I ended up with backache in morning from the soft mattress. The breakfast in the morning was fantastic and the staff in their kept the food replenished and the place really clean. The hotel is centrally located and easy walking to the center of town. Thank you for staying with us and for taking the time to post a review. I am happy to let you know that over the next year we will be doing some renovations. We hope you can come back and see us again in the future. Great place to stay. Staff is extremely efficient and pleasant. Love the fact I can bring my little Boston Terrier with me here. We had extra special requests for a fan in addition to the room heater and were quickly provided with one. All requests for 'extra' attention were met with satisfaction and very pleasant people. Always asking if there was anymore they could do for us. Breakfast was great, and fresh! They accommodated our top floor, corner room request. It was super clean and quiet. Room was spacious also and staff was incredibly friendly! We got a free wine tasting for 2 when we checked in from the woman at the front desk! Great service. Located right in downtown also-easy to walk anywhere within 10 minutes. Had a great stay in Walla Walla at the Best Western Plus Suites Inn. Only a short walk to downtown. Rooms were large and very clean. The standout was the daily breakfast - much more than the typical continental breakfast they offered eggs, sausage, waffles and other items you don't typically find at a free hotel breakfast. "What a great hotel this is!" The staff was super friendly from beginning to end. The cookies each evening at 7:00 PM are a big hit and the breakfast buffet is full of everything you need to start your morning and the cooks work hard. The bed was very comfortable and the room was clean with nice bathroom. We would stay here again. Thank you for staying with us and for your great comments. 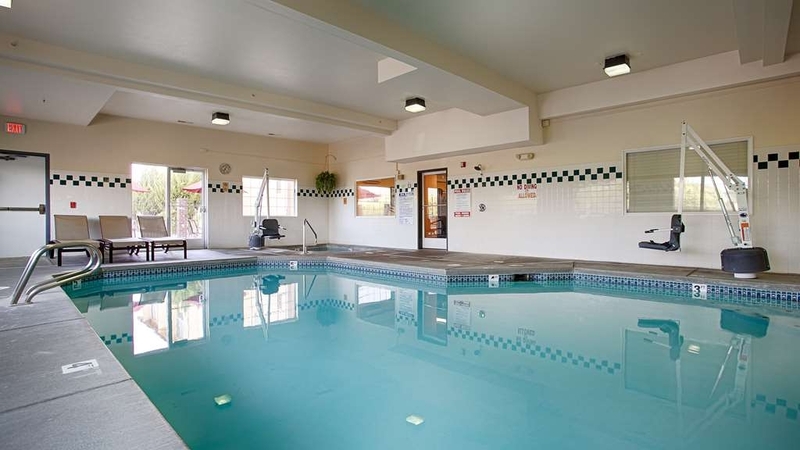 Perhaps on your next visit you will have time to enjoy our indoor pool and hot tub. We look forward to seeing you again soon. 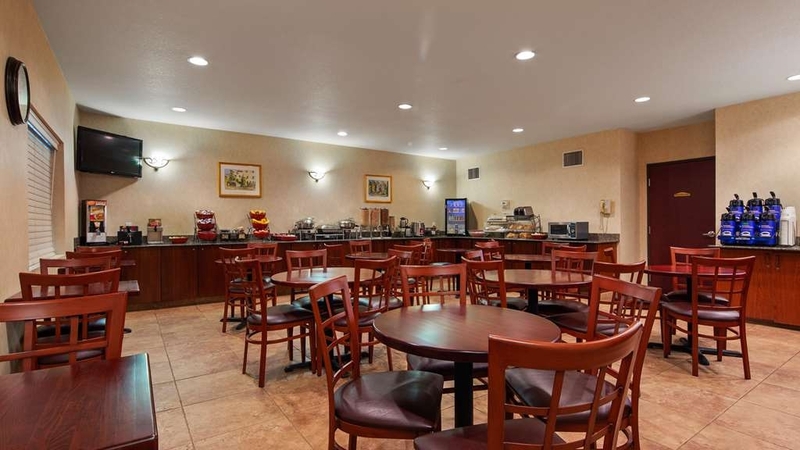 "super convenient for a Walla Walla visit"
This BW hotel is a short walk to the center of town. The rooms were clean and comfortable. Our room offered a small refrigerator, microwave, and coffee maker. Free, wi fi, parking and breakfast too. Fresh baked cookies at night made my wife happy. Great location. A short distance from Hwy 12 and only a 3-block walk to the main part of the city. The Staff were friendly and very helpful. The room was very clean and quiet. Breakfast was very good. We recommend it highly, and would definitely stay there again. "Clean, Quiet and comfortable - a great hotel"
We had a single King room with two small dogs. They charge $10 per night per dog; we usually stay at LaQuinta who does not charge and is not longer in Walla Walla. However we found our room to be large and room and very clean and the air was fresh as well. The staff was courteous and it was quiet which was nice as we were able to sleep well and our dogs did not feel responsible to bark. The pillows were not the most comfortable but next time we will bring our own, otherwise everything was very nice and we will stay there again. Efficient, friendly reception. Comfortable beds and pillows. Spacious, with a small sofa and table, fridge and microwave. Shower was decent, but hot. Vanity lights could be brighter. Large, hot breakfast with cereal and many fruits, rolls, yogurt, etc.. Breakfast server is a friendly, helpful hard worker. And, a complimentary USA Today! Oh, great TV reception and internet. We'll return. The staff and I are very pleased you enjoyed your stay with us. We look forward to seeing you again in the future. Started and ended with well trained, helpful, professional staff. What an enjoyable experience. Felt pampered by the people and facility. Impressed my wife, and she is had to impress. Can't say enough good about our stay. It is great to hear that my staff is providing the service that our guests deserve. This has a great location. You are only 3 blocks (or so) from Main Street where most of the restaurants and wine tasting shops are located. We had a king and the room was good size and the bed was comfortable. Everything seemed to be very clean and the hotel staff very helpful and friendly. It looks as though this might be an older hotel that has been recently refurbished. Breakfast was the typical fare but in relative terms, better than most. We would gladly stay here again. Thank you for staying with us and for taking the time to enter a review. As we are always looking for ways to improve our service, we appreciate any and all feedback we receive. "Way Above Average Best Western"
Great Best Western located within easy walking distance to downtown Walla Walla and all of the wine tasting rooms. The king room was very large, breakfast was included and quite plentiful, dog friendly, fresh baked cookies in the evening. You really can't go wrong with a stay here. Thank you for staying with us and for the great comments. We hope you will come back and visit us in the near future. We enjoyed our stay here close to downtown but in a nice quiet residential area. Good breakfast and friendly service. Good value and a comfortable room. Very clean and comfortable beds just a few blocks from Whitman. 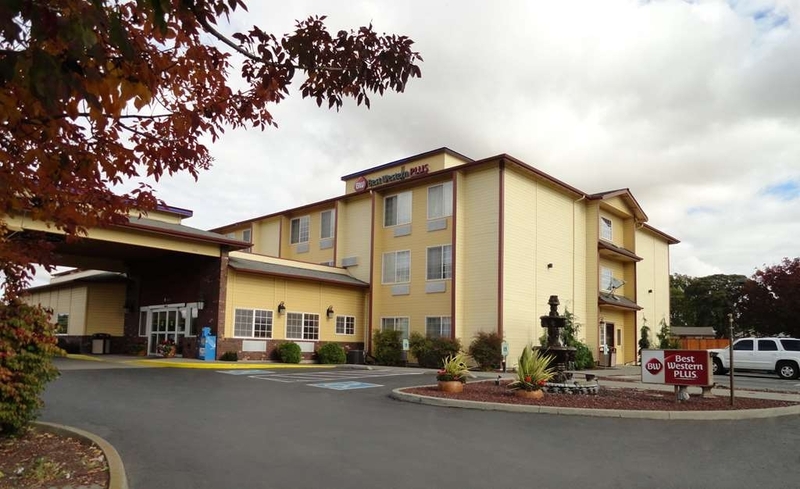 Located within a 5-minute walk of downtown Walla Walla, this hotel is a great value. Staff is pleasant, hotel is very clean, room was comfortable with a sofa, coffee table, Queen bed, and a small desk. Small fridge also. Large flat-screen TV with HBO and other pay channels was a pleasant surprise. I did not choose to eat the included breakfast, opting instead to walk downtown to the Maple Counter Cafe (wonderful!). However, I have had the hotel's breakfast in the past and found it to be fine - coffee & juice, eggs, cereal, make-your-own waffles, etc. Whenever I visit Walla Walla, this is always my hotel of choice. "Sisters trip for Walla Walla wines!" Had a great time in Walla Walla at the Best Western. The best thing about the Best Western is you can easily walk to town. There were four of us and we had two adjoining rooms. Rooms were clean and the free breakfast had a variety of food to choose from. I have stayed here before and will be back! "Close to Center and convient"
I enjoyed the stay. Clean pool and hot tub which was nice. The location was perfect. Not the 2 miles the Hotels.com says. Easy on and off the freeway. We did not eat breakfast there. Large clean room. Wif connection was good. Yes I would stay there again. My last review gave a below par, but I'm very happy to say this stay was excellent. We have stayed here a number of times (love that Walla Walla wine!) The welcome by a young man at the front desk was pleasant and quick. He greeted us each time we came in and left, wish I had caught his name. The room was large and clean. The bed was very comfortable, perhaps even new. The breakfast for good and the hot food hot. We're looking forward to our next stay. "Good place to stay on a wine tasting trip"
We enjoyed the great local restaurants. There are lots of places that offer wine tasting within walking distance of the hotel. The hotel was comfortable and convenient. It is close to the main highway through Walla Walla. This hotel has it all - great location, breakfast in the hotel, a pool, and a clean, comfortable room. Also it is a very reasonable price. I would not hesitate to stay here anytime I'm in Walla Walla. Stayed here for a Whitman reunion. Nice hotel with great hot breakfast and evening cookies! Will definitely consider for our next visit. The location is very handy and staff is friendly and professional. "Great stay as long as you like animals!!" Thank you for staying with us and we are pleased you enjoyed your time at our hotel. We do accept dogs only with an additional charge which is listed on our website. We also have an additional form that must be filled out that helps with possible issues of barking as well as any other pet related issues. We sincerely hope this does not deter anyone from staying with us but we do understand that not everyone enjoys dogs. 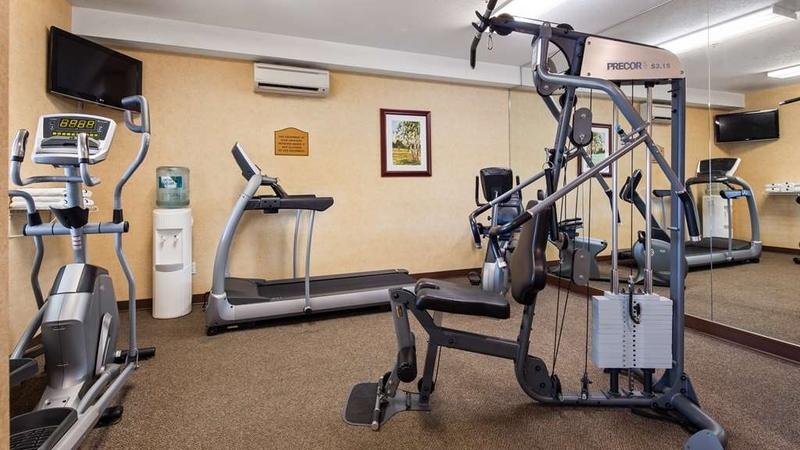 This is Perfect location to downtown wineries and restaurants - They have a great breakfast - fitness room and pool -- rates were awesome and room was perfect. We love the fresh baked cookies in the evening - enjoyed the smell coming in from outside but the taste was even better. Thank you for the wonderful comments and we are so pleased you enjoyed your stay. We hope to see you again soon. 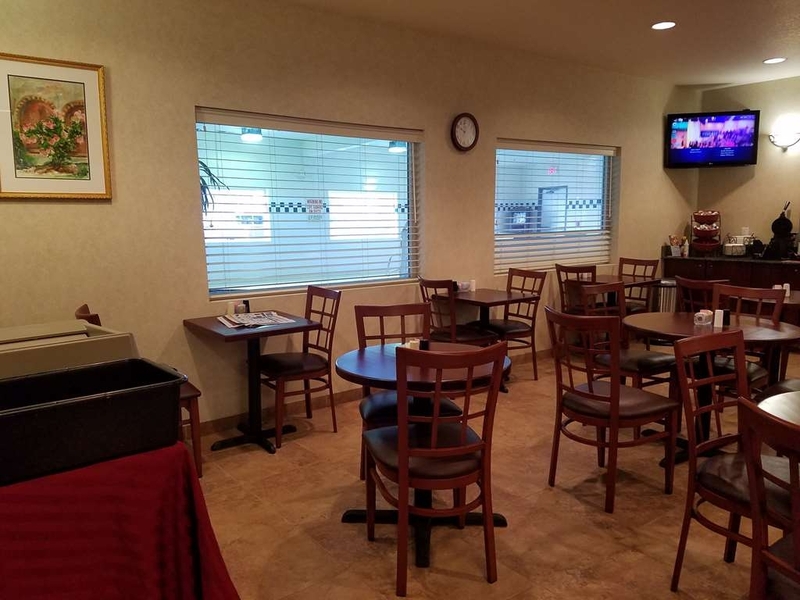 "Great stay and pet friendly"
The hotel is clean, well appointed and the location was an easy walk to downtown Walla Walla and all it has to offer. We stayed 9/11/16 and the man who checked us in was super friendly and knowledgable. He even baked cookies at 7pm. The room was comfortable. My only negative for room 209 was that it was missing a coffee table and the shampoo dispenser on the wall had dirty buttons. This hotel has a great pet area and they were warmly welcomed. Breakfast was ok, but not the best we have seen at BW properties. This property is perfect for exploring the region with pets. Will stay again. Hotel very clean, staff very nice and helpful. We came with a group of classic car owners and parking is very important, along with a place to park trailers. This hotel has very good parking areas, also handicap parking is a concern because a lot of classic car owners are older this hotel has an average number of marked spots, more would be nice. It's my second year in a row staying during the fair for work. Your staff is always so friendly!! Inclung the breakfast lady, (forgot her name) it's sometimes hard being away from home and living a hotel for work, but your staff makes it pleasant..thank you! We arrived in Walla Walla late the day before Labor Day--Rodeo Weekend. We needed a pet friendly hotel....we tried the Choice Hotels & found their nightly rate per dog out of line. We tried the Best Western Plus and found not only did they have a great room for us but it was walking distance to the downtown which is totally charming! I would recommend this hotel & stay here again. I loved staying here it was wonderful for our dog. They are an extremely dog friendly hotel. The rooms were clean and the beds were comfortable. They had treats for the dog and cookies for us. We will absolutely stay here again. Our family of four (two boys age 5 and 2) slept well, ate a healthy and yummy breakfast each morning, and enjoyed swimming in the pool! The hotel is close to downtown so you do not need to search for a parking spot-- just walk on down! For being so close and convenient, it was VERY reasonably priced. We has an excellent experience! Thanks! Great place to stay while in Walla Walla. Nice big room to spread out in. Great Staff, good breakfast, nice workout facility. Really no complaints here!! Price was good for the area. I loved the place. Thank you for staying with us and we hope you will come back again soon. We are very pleased you chose to stay with us during your cross country trek. Perhaps, should your future travels bring you back to Walla Walla, we will have the pleasure of having you as a guest again. "Great Value and Great Hotel!" We stayed here thanks to a group rate for a wedding, and was very happy with our stay! The rooms were huge and clean with no issues. Check in was a breeze and check out was even easier by just calling down to the front desk. My husband forgot to check the closet for his hanging clothes, and we didnt notice until the following day. The staff quickly located his items and sent them out that day. They arrived really quick and we were so thankful it was so easy to locate his items. We've stayed at the Marcus Whitman before, and this hotel is way better, for a lot less money. Its nicer, cleaner, and way more up to date. We will definitely be staying here the next time we go to Walla Walla! We are very happy you enjoyed your stay with us and that we were able to return your lost items. We look forward to seeing you in the future. "Motorcycle Trip to Walla Walla WA"
Centrally located between downtown and freeway access, though very quiet at night. Staff offered motorcycle parking in porte corchere right outside reception and offered to keep an eye on them. Much appreciated. "A very good BW in Walla Walla, easy walk into town." This BW was very well run, and we found it easily off the main highway. It was clean and quiet which is what we look for in a hotel when we are travelling. The staff were friendly and very helpful when it came to giving us directions to restaurants and area highlights. We also enjoyed the dynamic downtown area of Walla Walla which is a very clean and interesting city. Would definitely stay at this Best Western again! Thank you for staying with us and we hope your travels will bring you back to Walla Walla soon. Stayed at the Best Western Plus for a night on a recent trip to Walla Walla. Very conveninet location. Walking distance to downtown, a 5 minute walk or so. Rooms were clean, not fancy, but affordable, and the fresh baked cookies are good, but go fast. The breakfast buffet was fine, a good selection for everyone. 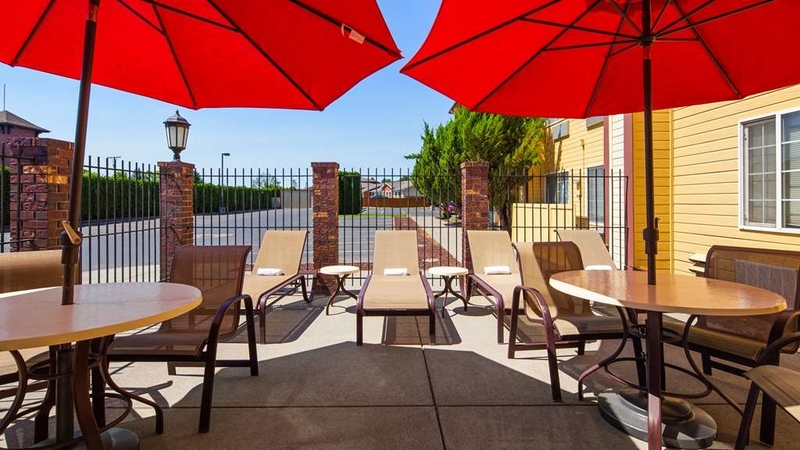 "Great place for families with a dog"
This Best Western is located within walking distance of downtown Walla Walla, near many wine tasting rooms, is a quiet location, offers a nice indoor pool for exercise or leisure, and is pet friendly. I recommend it to other families, and look forward to returning with my family in the near future. The rooms are very standard but clean. The staff are friendly and the hotel is within walking distance to downtown eateries and night life. The breakfast exceeded our expectations! The price was right for what we received and we weren't in the hotel much anyway. 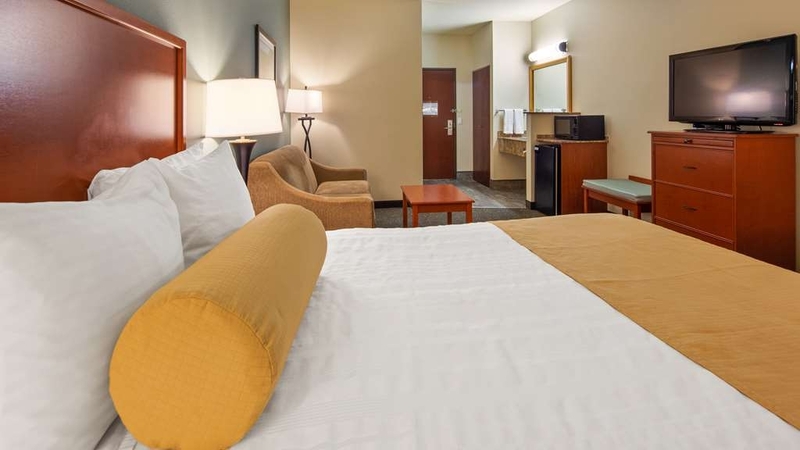 This hotel is within walking distance of Main Street and the Marcus Whitman hotel. The staff was helpful and friendly. I would not hesitate to stay here when in Walla Walla. The room was clean and comfortable. We are very happy you enjoyed your stay with us. We hope you have an opportunity to come back soon. When traveling I am not seeking to be pampered. I want a place that is clean, quiet and safe with a friendly staff. This place scores excellent in all areas. I had a single queen room on the second floor. It was a very wide room so I could have held a dance in it and would not have bumped into the furniture. I requested to be able to see my CanAm Spyder out my window and was granted my request. My bed was firm but not hard as a board. My tired back after 10 hrs on my bike is loving this. The room was clean and I did not hear my neighbors. I am a happy camper! We stayed at this hotel while on a wine tasting trip. I'm very glad we chose Best Western Plus, it lived up to all of our previous BWP stays in other cities. The hotel is centrally located, very clean and staff are friendly and helpful. Our room was extra roomy, with a sitting area with two large comfortable chairs, king size bed, microwave and small fridge. It was hot in Walla Walla (over 100) but our room and the common areas of the hotel stayed perfectly comfortable. I noticed that they include a form in the welcome packet that you can use to report any problems. We had no problems, but this is a great idea, I could have used a form like that for other hotels! The included breakfast was very good, hot eggs and sausage and the pastries were very fresh. Besides visiting wineries, we drove (too hot to walk) a 2-mile self-guided route to see old homes and buildings in the city. The oldest was a home from 1871, very interesting! We would definitely choose this hotel on a future trip to Walla Walla. The location is very good--just about 3 blocks from downtown. Everything was perfect--very very clean and well kept establishment, friendly and efficient service, large well set up rooms, good bedding, nice extra touches (cookies in the lobby, microwave popcorn in the room), bathroom worked well and was updated and spotless, plenty of parking. The hotel takes a pet for a very reasonable $10 and has a good pet area out back. The breakfast was very very good for a hotel breakfast. "Wonderful Place to Stay - Super Friendly and Helpful Staff"
We stayed in this hotel to go spend time with a friend in hospital in Walla Walla. It was about an 8 block drive to the hospital which was very easy. We had asked at the front desk how to get to the hospital and the front desk clerk not only gave us directions, but she also provided us with a map of the area. It was a quick and easy route and meant zero stress for us. Swimming pool was a bit chilly at first but okay once one was fully immersed in the water. Pool towels were easy to find and the pool area was very clean as was the rest of the hotel areas that we saw. We enjoyed our stay here very much and will definitely go back here the next time we are visiting in Walla Walla. We loved the central location of this hotel. The staff were very helpful and friendly. I had to ask for tea bags as there were none in the room ( only coffee). Then I needed hotel stationery , paper and envelope, on which to write a letter and finally, I wanted to be directed to the P.O. We received a little map of the downtown area from them and had a delightful walk through town. "Quick Stop in Walla Walla"
Stopped in Walla Walla to check out the local wine scend. We were pleased to find some great wines and friendly wine community. We stayed at the Best Western Plus in Walla Walla and were very pleased with their accommodations We will stay there again. We are critical people and here we did not have one critical remark! This is just a perfect location when visiting Walla Walla for leisure. Walking distance to downtown. Our room was ultra clean and fresh. The furnishings in perfect condition. This is a very well run property and well cared for. "Weekend trip to drive in and aquatic park"
We came for a quick trip over to Pendelton to take kids to the aquatic park then milton freewater drive in. Stayed here in walla walla since more options. Found everything listed to be almost 200 dollars and since we disnt know the area we came without a reservation. Saw all the great reviews and although normally we stay at comfort inn we could not pay 180.00 for a quick trip here. Decided to just show up and see if anything was available since all reviewers had great things to say. We now know why. Room was 50.00 bucks less then everywhere else but still same things we were used to at confort inn,, in fact even better!! Soy milk at breakfast for our lactose intolerant daughter, cookies in the evening and the staff was amazing. Signed up for rewards program and we will definitely be back. Way to go above and beyond and earned our future business for sure. "Easy to walk to everything in town"
The best thing about the Best Western is that you can walk everywhere. Rooms are clean and comfortable. Pillows are hit and miss. Rooms include a fridge and microwave and two sinks! Pet friendly too. We didn't try the breakfast, as there are so many places to eat in town. The hotel is a 5 minute walk to great food. Helpful, personable staff and the room was a great price. We are extremely happy that you enjoyed your stay with us. We look forward to seeing you the next time you are in Walla Walla. "Clean, comfortable, and a good value"
We stayed here for one night and were very pleased with our room, the amenities, and the staff. Our room was quiet and very comfortable. The Inn is pet-friendly and our small dog enjoyed the treats the staff gave her. The breakfast was excellent. Best Western is getting better and better at this aspect of service. We'd gladly stay here again. We stayed here for 5 nights and it was a very pleasant experience. The staff was polite, professional and helpful if we asked for any suggestions for restaurants, shops or winery's. The cleaning crew were great, asking us what time we typically wanted the room clean and working around our schedule. The room was clean, and good sized. The beds were a bit too soft for my liking but that is a personal preference. Fitness room was small, right off the pool, but stocked with towels and water. Was impressed with all the choices for the breakfast, they have a good selection of healthy food and offer gluten free items as well, bravo! Cookies at night were always a treat after a long day. Best part was there was plenty of places to walk to from the hotel for winery's, restaurants, coffee and shops. Would definitely stay here again! The good thing about the Best Westerns we've been to is that we know what we're going to get, and this one certainly fits. Very friendly welcome and quick check-in. 2nd floor room which was quiet, as requested. Bowl of candy at the check-in counter, cookies out in the evening, and the usual breakfast foods. A bag of microwave popcorn in the room was a nice touch. Soap, conditioner, and shower gel dispenser on the wall in the shower helps reduce the waste of all those little bottles. Free wi-fi worked fine. 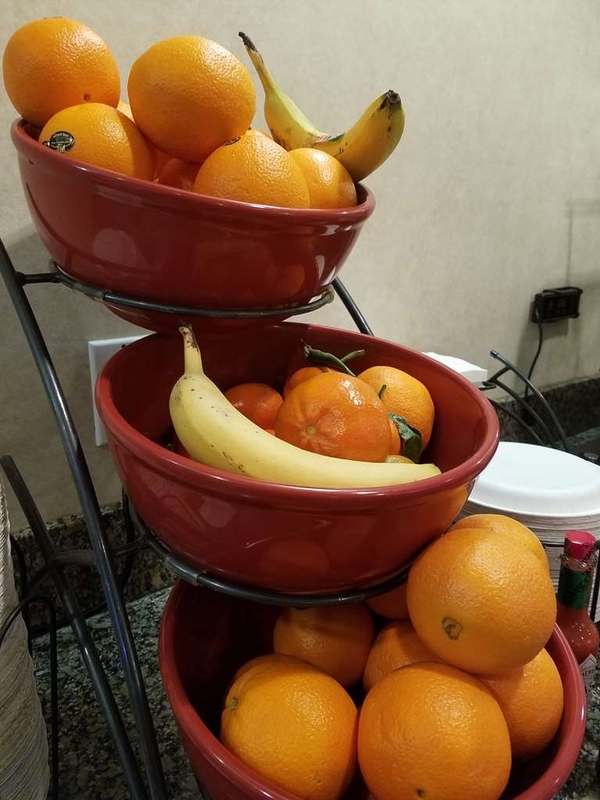 When I asked the woman working the breakfast room for ideas about places to see on our route (our way to find less obvious sites), she gave it some real thought, which we appreciated, and the front desk employee did the same. The mattresses--2 queens--weren't as comfortable as at some places, but were fine for a night, and the A/C was a relatively noisy unit that cycled on and off a lot. Small fitness room with machines that were clean and in good working order. We'd stay here again! 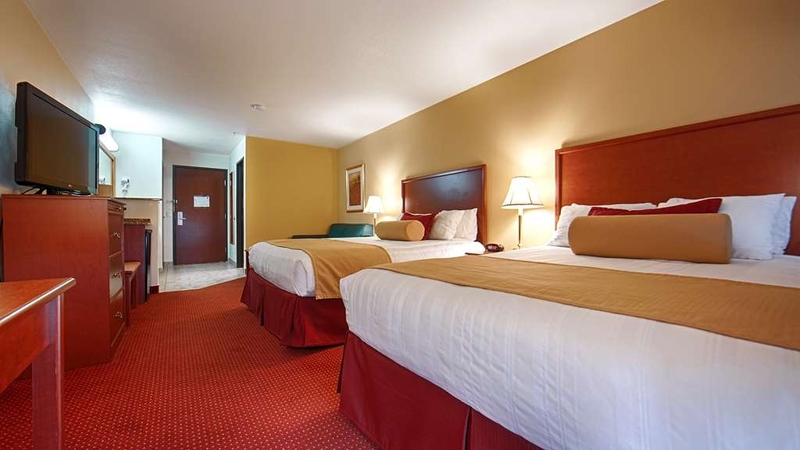 As a Best Western hotel I consider it comfortable and reasonably priced relative to other hotels in its class. I have stayed in this hotel numerous times in the past on business and noticed the breakfast service and selection is not as good as in the past (in my opinion-----) . Thank you for staying with us and I appreciate your assessment of our breakfast. We will continue to look at ways to improve. We spent several days here as a rest stop on a long bicycle tour. The person at the desk was very helpful. We were checked in well before the standard check-in time. The room is spacious, well arranged, and comfortable. Breakfast is tasty. Cookies at 7pm. Convenient walk to great restaurants and wine tasting rooms. Clean room and great air conditioning. It feels like a place that we would like to come back to. I am so sorry you did not enjoy your stay with us. We do try hard to make every guest comfortable. However, I can appreciate your comments about the configuration of our rooms with the sinks not being in the bathroom area. It works for some but other are like you and do not like it. Thank you for your comments and perhaps you will consider giving us another opportunity in the future. Our room was very clean and spacious, everything was in excellent condition. Very quiet area. No complaints about the room or the hotel in general. It is located off the highway and within easy walking distance to downtown and nearby restaurants. Plenty of parking. Breakfast room is a bit small when the hotel is full, but the staff work very hard to make your stay enjoyable. "Comfortable stay in Walla Walla"
Clean, comfortable room right off of US 12. Fresh baked cookies in lobby in the evening. Decent breakfast served until 10am. Indoor pool and hot tub. Within walking distance of a good restaurant, Jacobi's, for dinner. Would stay here again. "Who Could ask for anything more for a short stay?" "Excellent Staff, Good Value, Clean Rooms"
Staff was excellent all around. Cookies at night, Breafast opened early for our group, Check in and even the pool area, they just really did a great job. Will definitly stay again on our next trip down. "Welcome to a great stay"
The quality of the staff, and the attention to detail makes this the place to stay in Walla Walla. The recommendations for lunch and dinner made the stay a joy. Being pet friendly, was another reason we made this our place to stay. It is always good to hear that the staff is doing a great job. "In the heart of Walla Walla"
It is in the heart of Walla Walla. Easy access to the airport, very close to the Veterans Memorial golf course. A short walk brings you into "downtown", full of shops, restaurants, many wine bars. Next door is a wonderful restaurant, with real Italian favorites, that I enjoyed more than once during my stay. It is my hotel of choice when I am in the area. Thank you so much for staying with us and we look forward to seeing you in the future. "Nice place for an overnight stay"
Room was large and very clean. Good place to rest overnight while traveling through the area. Front desk clerk had zero personality, and did not care if we stayed there or not. Breakfast was very nice; presentation was good, and had several choices. Hotel is pet friendly - charges $10.00 per pet. Thank you for staying with us. I am happy to hear that the room and breakfast were good. I apologize on behalf of my front desk person and hope you will give us an opportunity in the future to make amends should your travels bring you back to Walla Walla. From the time we entered the hotel to check-in to the time we checked out, the service and quality of the facility were First Class. The quality of people was superb. I would highly recommend the hotel any time you are in the Walla, Walla, Washington community. 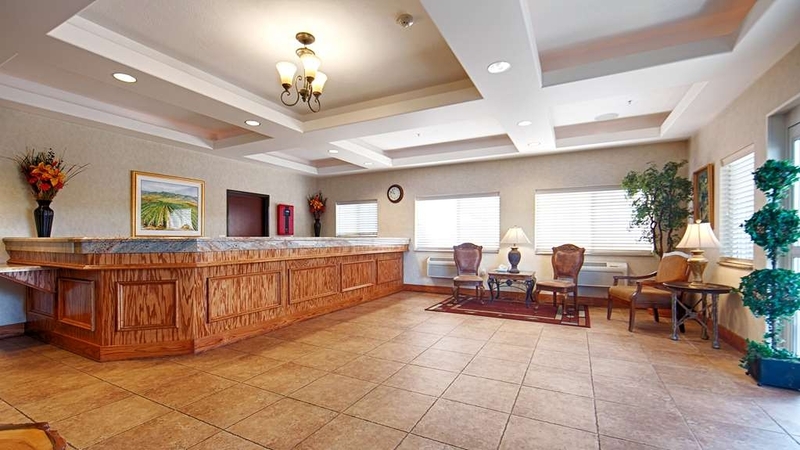 "Another wonderful experience at a Best Western"
This hotel is conveniently located in downtown Walla Walla - easy walking distance to tourist attractions, restaurants, and other businesses. The rooms are clean and comfortable. Friendly service, nice hot breakfast with a range of options for different dietary needs. On the road you expect and hope for a positive experience for a reasonable price. This hotel was excellent and the staff very professional. We will be using this Best Western for future stays in the area. Great Job staff. We appreciate your wonderful comments and look forward to seeing you in the future. "Decent hotel but probbaly not a "Plus""
Stayed here for one night and though the hotel was fine it felt more like a standard Best Western than a "Plus". The room large (if a little dated in terms of décor) and there was a great Mexican restaurant across the street. You can also walk into Walla Walla from here. Would stay again but only at a good price. Were greeted with friendly service! Chris was fantastic, he helped us with where to eat, giving us maps for walking to the various tasting rooms just a few blocks away, and made sure we knew about the warm cookies served at 7pm! Our room was clean and the housekeeping staff was equally friendly, wishing us a good morning each day as we left. The breakfast in the morning is a generous continental selection with plenty of hot coffee..nice to note they have gluten free options should you need it! Checked into this hotel with a reservation for 3, for a room with 2 queen beds. Chris and Renee (check in staff) asked if we needed anything else. We told them we were good, we were ready for a "girls weekend". ( Two adult sisters and there 80+ year old mom). Chris and Renee immediately decided we needed a suite room, NO EXTRA CHARGE, with three queen beds, and further accommadations for our mom with handicap accessories. This hotel service is OUTSTANDING!! Thank you bunches!!!! Can't wait for our visit here in Walla Walla, WA. Stayed at BW + for the 3rd year in a row and brought 5 other couples to enjoy Walla Walla's Wine country. The hotel is clean and the staff are all very friendly. Things I liked: cookies served in the evening, refrig in room, free internet and complementary breakfast. Great stay for the price. "Nothing special, but clean and well located"
Not the Ritz or anything, but a clean hotel with a friendly staff located easy walking distance from downtown Walla Walla. The pool, while small, is clean and easy to use (although the towels are pretty small and scratchy). The breakfast is complete, but certainly nothing to write home about. Overall, though, this is one of your better hotel options in Walla Walla. Only stayed one night, but it was a really nice stay. The lobby and room were well appointed and clean. Microwave and Refer in the room with a nice breakfast in the morning. Walk in shower was nice, but wish hotels would have "glass" glasses instead of plastic. Bed was not the greatest, but was fine. Nice big room and the front desk receptionist was great and very efficient. Would stay here again. Thank you for staying with us and I appreciate your comments. A little surprised about the bed comment as many of our beds are less then 1 year old. However, I will review our bed change spread sheet as perhaps we need to do more. "Great place to stay in Walla Walla"
We stayed here while attending our nephew's graduation from Whitman College. The hotel was conveniently located to the downtown and the college campus. The price was incredibly reasonable and the breakfast good. Great value. The rooms were clean and comfortable. The staff friendly and attentive. Can't beat it for the price! This Inn is just off the 12 near to down town. The room is a model of value and cleanliness. We ask for a specific room as my son's need require this room. The staff is always friendly and helpful. The breakfast area is clean and well stocked during the morning meal. The only thing that would make this place better if they offered ChargePoint charging for guests with electric vehicles. I would put then just on each side of the entrance. This would highlight a forward looking position by the owners. This would give my car recharge while visiting points during my stay. "Walla Walla Wine Country visitor"
We enjoyed our stay and the full breakfast choices. The staff were friendly, and helped with everything we needed. Our room was clean and quiet with a walk in shower and nice decor. We would return to this hotel again. We ate downtown at a healthy deli style bistro, and a local brew pub. Both were excellent. The surrounding SeVein Vineyards Region and wineries are beautiful and top quality. It is always wonderful to hear good things about our hotel. We are very happy you enjoyed your stay with us and look forward to seeing you in the future. We found the staff at the Walla Walla Suites Inn to be professional, courtesy and helpful. The king room was comfortable, clean and had good "moving about" space between the furniture. We would definitely book there again. Thank you for staying with us. We are very happy you enjoyed your stay with us and look forward to seeing you again in the future. "Great place to be after a day of wine tasting." A comfortable place with friendly staff. We arrived earlier than the allowed check in time but the front desk staff worked with us to get us checked in. We had a full day of wine tasting ahead so it was nice to get settled in before heading out. The art work in the halls and lobby were done by one of the owners and it is spectacular. Staff knowledgeable about restaurants and best wineries to visit. Breakfast had lots of items to choose from. All in all, a comfortable enjoyable stay. Thank you for the wonderful comments. We hope you will come back and visit us again soon. "Comfortable and clsoe to downtown"
We stayed at the Best Western in Walla Walla due to a fire in our trailer before we arrived at a planned rally. We were able to get a room with short notice and it met our needs. In past years we had stayed at this motel during a large car show with many other classic car owners. We enjoy the sights around Walla Walla and found the staff to be very helpful! Thank you for choosing Best Western in your time of need. We hope to see you in the future under more pleasant conditions. Best Western is a name you can count on and a Best Western plus is even better. Rooms were clean and the rate was good. We did not have breakfast as it ended too early for us ( It was a weekday!). Good location near lots of other places to eat and things to do. We are happy you enjoyed your stay with us and hope you will come back again soon. "Very clean property with pleasant staff including housekeepers!" Check in was quick; staff members were all very professional and genuinely helpful. Had a door slammer first night but other than that very quiet and clean room. I took advantage of the properties location to downtown and wine tasting venues. It was an easy walk to everything, local restaurants, book stores, Macy's and even Safeway . "Another nice stay at this B/W"
This is our second time staying at this B/W in the past few years. So many reasons. Wonderful staff. Clean rooms. Very good breakfast with many things to choose from including hot food. Three block walk to the old area. We stayed April 25th, 26th and 27th in room. 331 We had a comfortable king size bed. Two comfortable chairs and one ottoman. Sink was separate from the shower and toilet room a real plus as far as we are concerned. Also a pop corn package to make in the microwave. Another nice stay. Plan to come back again. We appreciate all the wonderful comments and look forward to seeing you again in the future. Rooms were generous in size, clean and comfortable. Staff went out of their way to make your stay a good one. Location is great for walking downtown and to local eateries. Will stay here again when in the area. 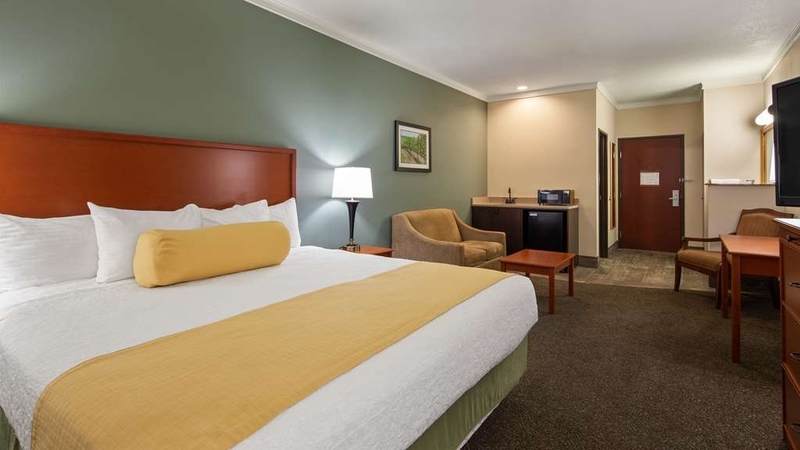 "Best Western PLUS Walla Walla Suites Inn"
This is an excellent hotel, located near downtown Walla Walla. The room was comfortable, and the hot breakfast was very good. I would recommend this hotel to all travelers. The staff was friendly and knowledgeable at both check-in and check-out. My wife and I will use this hotel in the future. "Great fun in Walla Walla"
A fun stay in Walla Walla for a girls week-end with my sister and sister-in-law. Our stay at BW was a perfect fit for our needs. Close to downtown, wine tasting and great food. Even had a Sat.morning Farmers Market within walking distance. We are pleased you enjoyed your stay with us and hope to see you again in the near future. Very comfortable hotel with three things I value--quiet, hi-speed wif-fi, and a great breakfast. Within walking distance of the wine tasting rooms in the downtown area if that's your thing. Breakfast was definitely above average, with fresh cut-up fruit in addition to whole fruits, several kinds of eggs, a "fix your own" oatmeal bar with lots of add-ins, and even a couple of gluten free cereal and baked good choices. And all of that for a great price! What's not to like? Thank you for choosing Best Western Plus for your lodging needs We are very happy you enjoyed your stay with us. We hope you will come back soon. On a quick call to some hotels in Walla Walla for a one night stay I picked Best Western. I was there for a procedure being done at the VA Hospital and needed somewhere that I could park a semi-truck. They had parking and also gave a veterans discount. The rooms were big and the beds comfortable, the only downside was the morning cleaning crew which I had to go out in the hall and ask them to quiet down. Thank you for staying with us. I apologize for the issue with the staff. I will speak with them about the importance of consideration for the guests. Thank you for bringing this to my attention. We hope you will consider staying with us again in the future. "Best Western Walla Walla - Great Value"
Great place to stay when visiting Walla Walla. Very clean, good breakfast, central location, friendly staff. Could improve the in room A/C units as they were a bit loud and hard to regulate during the night. Thank you for staying with us and for letting me know about the AC. I apologize for the issue with the AC. I will have maintenance check the AC units to ensure they are working properly and to do any "Spring cleaning" that may be needed. We hope you will consider staying with us in the future. Comfortable, quiet hotel with nice suite rooms. Large refrigerator with freezing compartment in each room. Staff was very friendly and helpful. Hotel is very convenient to downtown wine tasting and good restaurants. There are not many good choices downtown. So the hotel can charge more. We felt it should be in the $80.00-90.00 range. Shower was just warm enough to use. No ice on third floor. Newer hotel clean and staff were pleasant and helpful. Breakfast area was crowded and noisey, we went elsewhere. Thank you for staying with us. We will certainly consider your comments as we look at how to improve our guest expectations. "Our Walla Walla Home From Home"
We have no need to look further for our trips to Walla Walla. Best Western PLUS Walla Walla Suites Inn is a fantastic stay and all the staff make us feel at home every time. Love the town and love the accommodation and people. "Convenient location for a wine tasting weekend"
We stayed here for a night while spending time wine tasting in Walla Walla. Just off the highway, the location is within close walking distance to the downtown tasting rooms and restaurants. While the lobby was a tad dated, it was tidy and well kept. The woman checking us in was very pleasant and helpful. Our room featured a queen size bed, a small sitting area and full tub with a shower. Overall the room was quite spacious and very clean. As with much of the property, the decor and furnishings are a bit dated but, well maintained. There was an indoor pool and jacuzzi that we did not make use of. They offer free breakfast in the morning which featured both, hot and cold items. There was plenty variety to choose from and it was a great way to start the day. The property is a great value especially when you consider what some of the higher-end hotels charge. We will definitely return the next time we are in Walla Walla. Thank you for the great comments. We look forward to seeing you next year. The hotel is right off the Hwy and in town. You can walk to the downtown tasting rooms, restaurants and shops. It's clean and the people are friendly. As far as hotel breakfasts go, this is a better one with several proteins. The Internet is good. We are very pleased you enjoyed your stay with us and look forward to seeing you next year. Our stay was nothing spectacular. The room was average, the usual decor for Best Wester, but not ecepetionally clean in the bathtub. The bed had a very soft mattress and was not comfortable for someone used to a firm mattress. The pillows were very poor. "Sleep Study in Walla Walla, WA"
We had two grandchildren 8 and 10 they really enjoyed the pool while grandma was at a sleep study. Grandpa and our Lab were in charge. Everything was just perfect for all of us. Thank you so much for your excellent service. This is a excellent hotel to stay at. Very friendly informative staff, clean rooms, great breakfast in the morning, and nice warm cookies at night for all guests. Nice pool and fitness room. Our 2 queen bed room had a small couch for sitting and watching. Also we had a refridgerator and microwave. Excellent place and quite affordable. Best Western has become my choice for company travel. Doing a lot of work on the road, different places and changing scenery, sometimes a consistent staple can be appreciated. Having the complimentary breakfast each morning saves a great deal of time, and its nice to bring a bit of "routine" on the road. Thank you for staying with us. We look forward to your next visit. "Another comfortable stay at BW Walla Walla"
We have stayed at this hotel several times in the last 3 years. It is in a convient location, close to hospital and Dr. offices. Always a comfortable stay, friendly staff and affordable. We also like this hotel as they are pet friendly. "Nice in the middle of town"
Good location downtown. Easy to get to everything both in and out of town. Friendly, very helpful and great staff. Good breakfast and cookies every evening. They have gym equipment and a clean pool to enjoy. Thank you for staying with us and we are very pleased you enjoyed your stay with us. "Best Western Always Comes Through"
I go to Walla Walla for business often, and sometimes at the last minute. Best Western in Walla Walla comes through for me with good prices and a hassle-free check-in process. I choose this hotel often because they have wonderful beds! My only suggestion is they make the dining hall larger, as this hotel is popular and Sat morning breakfast can be crowded. Other than that, I give them a big thumbs up all around! Thank you for your wonderful comments. Unfortunately, at this time we are limited in regards to expanding breakfast room but I would love to find a way to make it bigger. Restful and clean place for a relatives visit. Perfect access to interstate highway systems, winery's, downtown restaurants, shopping, and Colleges. This is an up and coming community with great growth potential. Happy to hear that we were able to accommodate all your needs. We hope you will come back soon. The rooms were cleaned and nice. Their breakfast was a little busy but the staff did a good job at keeping everyone happy. We used the pool and it wasn't 100% cleaned and not enough towels. We will stay here next time. At check in, the receptionist was very helpful! Nice staff, clean rooms , pool and hot tub area. Work out area top notch equipment. I dont consider any other place in Walla Wallaskcmeikmjd dkdmc dmkcmndlc dkdcmdmcmd klkcmdldm kmckdk,d kmvmdkcm cd. I hate this part where I have to use 200 predetermined by yoiu words or characters. Next time I try this if requirment is still present I will not bother. My time not yours. Thank you for the opportunity to be of service to you and your family. We look forward to seeing you in the future. "Good dependable accommodations, very nice staff." Our room was clean, comfortable, and quiet. The staff was helpful, and welcoming. The buffet breakfast (yogurt, fresh fruit, loads of cereal and bread choices, some hot entrees, and more) was fair-to-good, but better than this type of thing usually is. All in all, a very good experience! "First time in Walla Walla"
Was in town for business. Also my first time visiting walla walla. The hotel was pleasant. One of the nicer Best westerns I have stayed in. Great selection at breakfast. Staff was friendly, and helpful at all times. Loves The Location On This hotel. Allowed a lot of central locations to downtown shopping, eating, drinking, and of course wineries! This is the place where everything comes together in near perfection: attractive facility and decor, cleanliness of public areas and rooms, quality amenities, and a top-notch staff that is professional and caring. Traveling with elderly parents several times over the last few years, this is where we feel at home. It has been a pleasure to have you and your family stay with us. We look forward to your next visit. 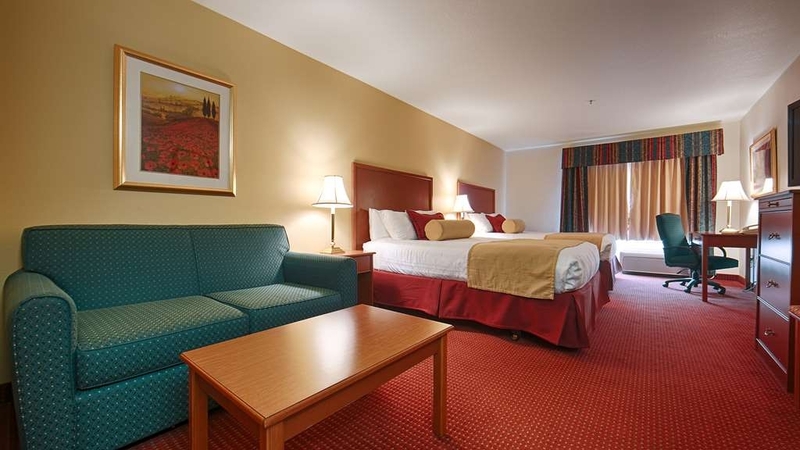 "Excellent staff and clean room"
Very nice staff, The room was spacious and clean. The pool and hot tub area was well kept and stocked with towels. Exercise eqpt was all in good working order and quality brand. Now about this trip advisor review. It mandates 200 words or not accept my review. When I was informed such by the pop up window I almost just exited however needed to voice complaint. Client should be able to say what and how much. We are happy to know you enjoyed your stay with us. I also appreciate hearing that the staff is doing a good job both in friendliness as well as keeping things in good working order. We look forward to your return. We always stay at Best Western when we are in town for our grandkids events. It is convenient to the venues where they swim or the gyms they play basketball. We have stayed here numerous times in the past years and have always been very satisfied with our experience. And love the evening cookies. I would and do plan on staying at this hotel again, the staff was amazing the neighbor had two dogs and I never heard them except once and that was when they were walking down the hall. I would recommend this hotel is anyone. The prices are reasonable compared to other hotels of this quality. Thank you so much for your comments. We look forward to having you stay with us in the future. "It Doesn't Get Any Better ! ! !" Easy check in, good quiet stay, good cookies, good location, clean pool, and the BEST BREAKFAST we have had at any Best Western. They even had potatoes. We will go back to the Best Western Plus in Walla Walla, WA. Very happy you enjoyed your stay with us and hope your next stay will be as great. "Very friendly staff and comfy rooms"
I have never stayed at a Best Western before but I have to say staff are very helpful and they all remember you name. You always get a smile and a greeting whether your coming or going. The breakfast is good and the hotel is close to everything. I will stay here again. It is wonderful to hear that my staff left a positive impression. we look forward to seeing you again in the future. "Great stay and great location"
The Best Western hotel is a terrific place to stay. It is located a very short walk from town center and tasting rooms of 25 wineries. Easy access to the 12 and the 125 Highway's. The hotel staff is great and the have cookies for you every night. "A great Place to stay when visiting Walla Walla"
Thank you for the wonderful review. We are happy that your stay with us was great. "Great respite for long road trip"
This Best Western Plus was as nice and comfortable and friendly as any. The staff was super helpful. Our rooms were spacious, clean and well appointed. The beds were comfortable. We were fortunate to delight in our requests of having ground floor adjacent rooms. The breakfast was good and had lots of options. Since we had car troubles the following day, we were grateful to have had such a pleasant and restful night. We are pleased that you enjoyed your stay with us and that we were there for you in your time of need. "One of the nicest BW I have stayed in"
First and foremost, a wonderful and pleasant front desk staff; they were great to interact with and knowledgeable of the area. The rooms are clean and fairly large with refers and microwaves. There is a decent breakfast in the morning with all of the usual amenities, but there was one standout...they have a chocolate muffin which is very, very good. 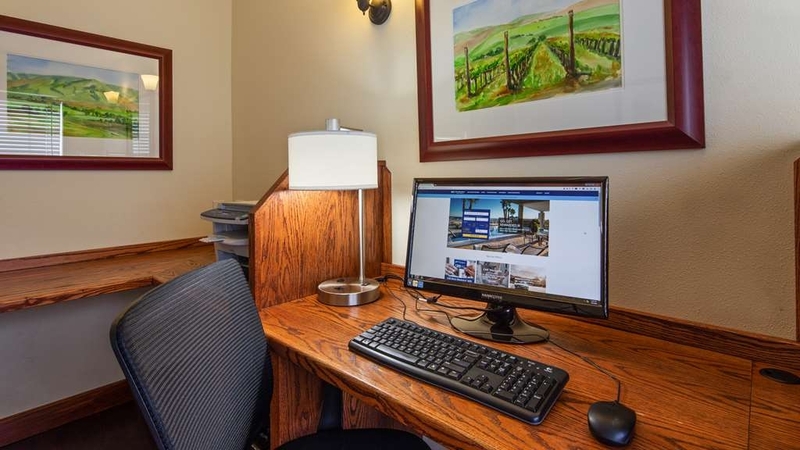 The hotel is close (walking distance) to downtown Walla Walla and all of the quaint pubs, bistros, and wine tasting rooms; so you really don't have to drive anywhere to get your groove on. 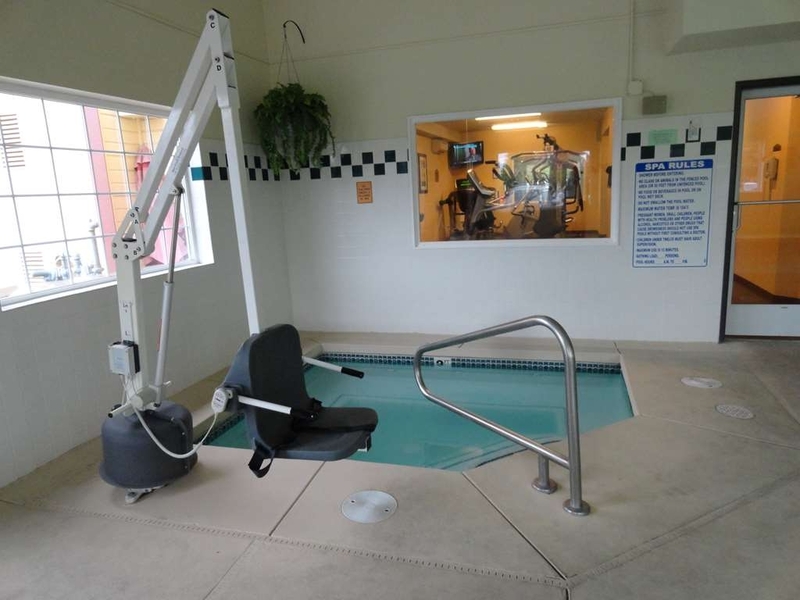 There is an indoor pool and spa with handicap access if needed. The fitness room is better outfitted than larger hotels I have visited. The only downside on this visit was the spa was out of use for needed service. Certainly not their fault. I will stay there again. The price was good and the people greater. Thank you for choosing Best Western and for the wonderful comments. We look forward to seeing you in the future with a working spa tub. We have stayed at this Best Western several times over the past few years, it is our top choice, in price, quality and amenities. The hotel is always clean and employees are friendly and helpful. We always stay at the Best Westerns, a hotel company we trust. We are happy to know you enjoyed your stay with us. Thank you and we look forward to seeing you in the future. We stayed while my daughter toured Whitman College. If she decides to attend there, we'll definitely be staying at this Hotel again. 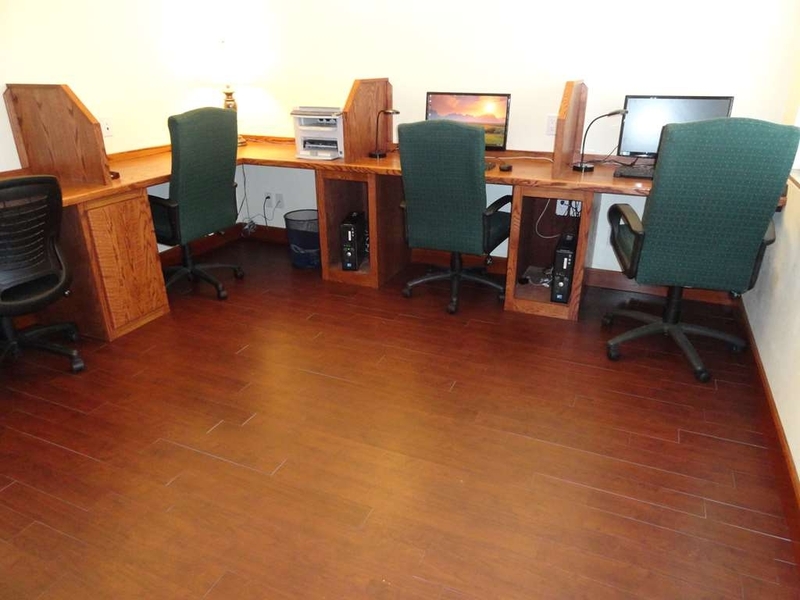 Clean, newly remodeled, friendly staff, all at a reasonable price. It's close to the college and the downtown district, which has good restaurants and shops. It is good to know that you enjoyed your stay with us. We hope your next stay will be as good or better. Stayed here as a family of 4. They have a great 3 queen suite- huge & comfortable. Very clean. Breakfast was good enough- eggs were kind of gross, but plenty of other options. Pool area was fun for kids. Overall a very good option in walla Walla. We hope your next stay will be as good or even better. Perfect location for hitting up all the tasting rooms you could dream of. Clean and comfortable. The only downfall was the breakfast. Most items were cold and looked very uneatable. But, that wasn't a huge issue as there were great breakfast restaurants in the area. We are pleased you enjoyed your overall stay with us. I do apologize for the breakfast and will try to make sure that the staff do a better job. "Comfortable and affordable for business stay"
Thank you for the wonderful comments. I have shared them with the staff. The hot tub was down as it needed a new heater which has now been replaced so is working better then ever. We hope your next visit will be better then this one. "Best Western wait list really works!!" I put my reservation in a little later than usual and they could not accommodate us for the whole weekend. We had one night with them and one night with another hotel but we were put on a wait list. I was not hopeful but a week before our arrival I got a call and an email stating they were able to complete our reservation for the whole weekend. Best Western continues to impress me with their attention to details like this!! I have been traveling with Best Western consistently for at least 14 years! I am so pleased we were able to accommodate your request for the weekend. The waitlist is a bit of a gamble but it does pay off about half the time. It works for the guests and ensures we fill rooms. Nice quiet hotel, clean rooms and very good breakfast. Large well lighted parking lot. Good value for the money, I would stay there again and I recommend it. Normally the love seat couch in most hotels is a broken down piece of crap. This room the love seat was reasonable new and the cushions were firm. "Consistently Excellent Value - Awesome Breakfast"
I have been staying at this hotel for over 10 years for business and few times for pleasure. The value for the money is unmatched in Walla Walla. There is another higher end historical property in Walla Walla that is also very nice, but you're going to pay quite a bit more for a negligible bump in quality. Thank you for the wonderful comments and for being a loyal customer. We look forward to your next visit. Appearances can be deceiving. This hotel looks like a BW Plus, but subtle things, such as a lumpy mattress, nearly thread-bare linens dampen an otherwise good experience. Also, the room maid forgot to replace used towels and soap. However, at the price, it meets the basic BW standard. I apologize that your experience was not what it should have been. I hope you will give us an opportunity in the future to redeem our reputation. "Second best hotel in Walla Walla"
You have to be honest and say that the Whitman hotel is the best place to stay in town, but this place is a close second and a lot less expensive. You can still walk the 2 blocks to have dinner at the Whitman or better yet, try the Italian restaurant directly out front. It is located inside an old railroad car. The hotel was clean and comfortable with large rooms and plenty of parking. Beds and bedding were top notch. The free Breakfast was so-so, but otherwise, everything was very good. I would definitely stay here again. I appreciate your comments and I am delighted to be compared favorably to the Marcus Whitman. We look forward to seeing you again in the future4. Nice size room with comfortable setting and ottoman. Bed ok. Ate at the Mark in Marcus Whitman Hotel, food was great and wonderful presentation. Also ate at The Depot good Italian food. There are over 100 Wineries in the area. This is one of the nicest Best Westerns we have stayed at. Staff and facility are top notch and the room was nicely appointed. The variety of the hot breakfast gave us many choices for a multi-night stay so we never had the same thing twice and the freshly baked cookies each night were a great treat. "Wine tasting trip to Walla Walla"
Best Western was a great place to stay. Just a couple of blocks from city center. Tasting rooms and places to eat are only a few blocks away. There is also a small farmers market nearby. It is easy to walk to many of the winery tasting rooms and restaurants. Didn't have to move the car all weekend. "Solid value and good location but I'm not sure I'd stay here again"
We stayed in double queen room for two nights (Friday & Saturday) and were in town to spend the weekend wine tasting. I picked this hotel because of its positive reviews on this site. 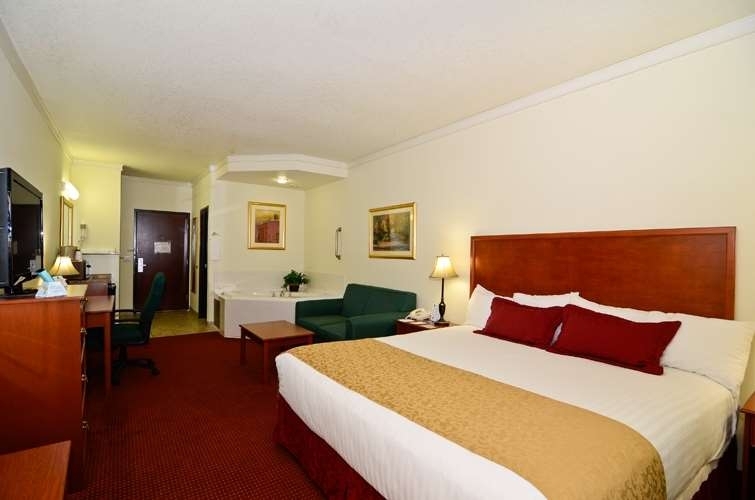 Pros - large clean room, super comfortable beds, location, AAA room discount, friendly staff. Cons - the mattress are super deep but they use regular sheets which don't fit so the sheets have a tendency to almost come up off the corners of the mattress because they ride up, the pool and hot tub are only open until 10 pm while the hotel right next door has a sign out front that says their pool is open 24 hours which would make it possible to actually enjoy the hot tub without having to listen to a bunch of screaming kids in the pool. The hot tub was having a temperature issue, making it almost too hot to use. The issue had been reported earlier in the day but hadn't been fixed. No Comment - We didn't have any of the complimentary breakfast so no first hand observations but I overheard another guest at check out complain that the buffet was out of a lot of stuff when they stopped by and had to wait awhile for things to be refilled (eggs & breakfast meat). Bottom line - I might stay here again but I priced the hotel next door with the 24 hour pool and they were significantly less expensive so I'll be trying that hotel on my next trip to Walla Walla. Thank you for your comments as it gives us something to work with. I apologize that we did not meet your expectations. Our pool hours are due to close proximity to sleeping rooms. Perhaps we may consider "adult time" from 10p-11p. "Clean, average hotel, great breakfast"
I stayed here one night for a business trip. The hotel is at a great location in downtown Walla Walla. The staff were very friendly, and there were fresh-made cookies available when I arrived in the evening. The hotel itself and the rooms are a little outdated, but clean. The breakfast was really great, with lots of options available including hot food. So happy you enjoyed your stay with us. We hope to have a "makeover" soon. Went to a winery stomp, Basel Cellars and stayed and very convenient location, clean rooms reasonable rate, Walking distance to dinner, town etc, Rooms were clean with indoor pool and ho, hot hot tub. Has an amazing breakfast included with lots of choices. Good location, easy walking distance to downtown, restaurants, and wine tasting locations. Very pleasant, professional, helpful staff. Clean, spacious, comfortable room. Includes adequate free breakfast. "Customer Service Re-Training Urgently Needed!" We have been going to this hotel for a number of years now, usually twice a year. It used to be the front desk would smile and welcome us. They made us feel they were happy we chose them (again), they always offered to help with any directions, dinner plans or other requests we may of had...this was offered before any asking on our part. Our visit in July and then this one, the front desk seems to feel we were lucky to be there and we should be the ones to appreciate them. Rarely any smiles, never a thank you, even on checking out, just a real lack of customer service. The breakfast room tables are not wiped. It just seems to be messy. I know it's small and crowed and there are times it's tough for the crew to keep up, but to me, it seems there is a lack of planning in cleaning, refilling the coffee and keeping the warm (not hot by any stretch) food replenished. It's time for us to look for a better place to stay when in Walla Walla. I am very sorry this visit was not up to our usual standards. Thank you for letting me know. I will certainly take steps to ensure this does not happen in the future. I sincerely hope you will give us another opportunity to redeem our reputation.